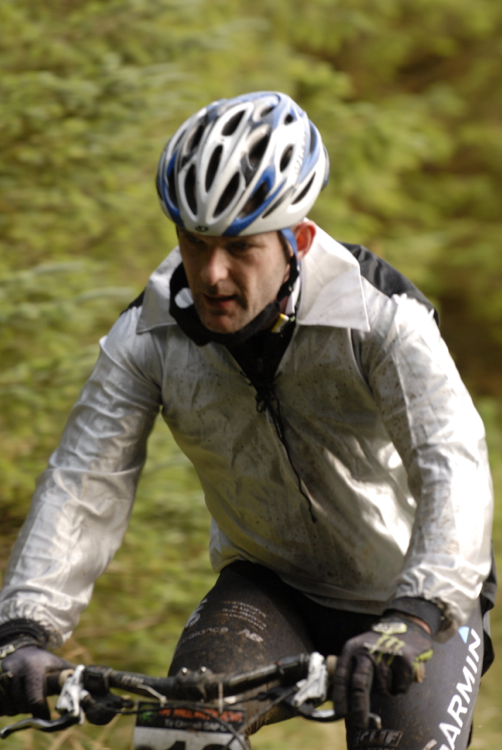 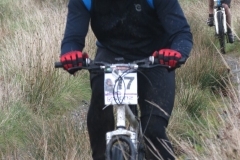 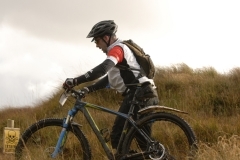 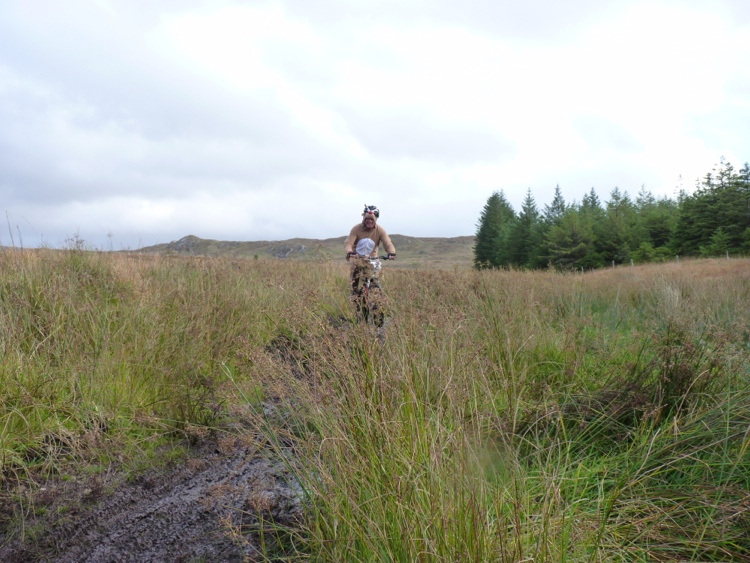 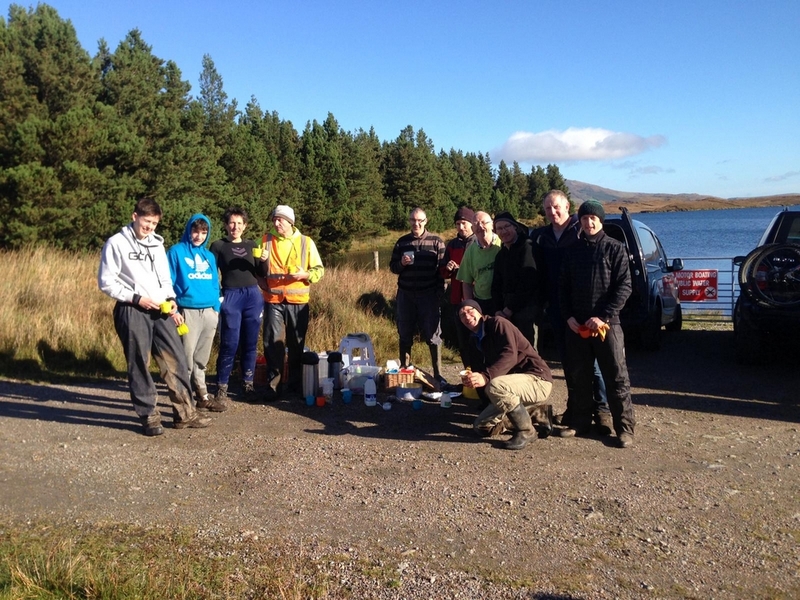 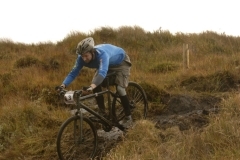 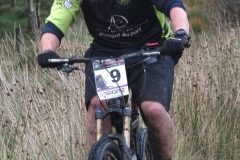 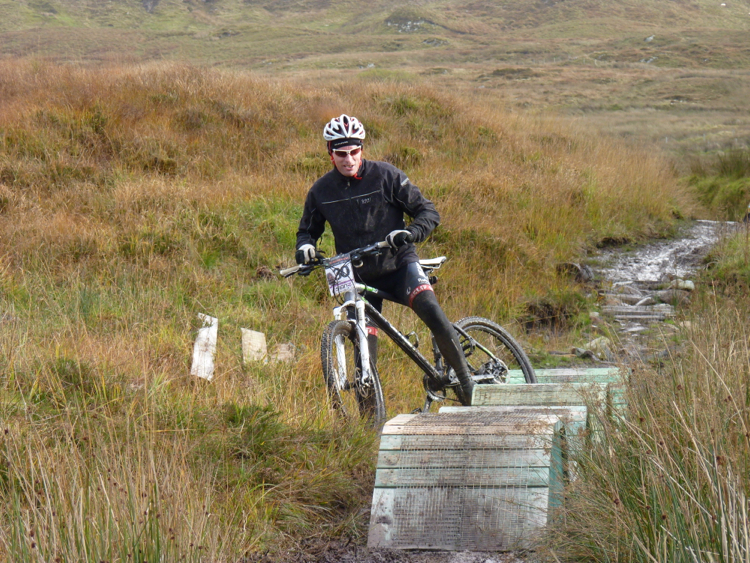 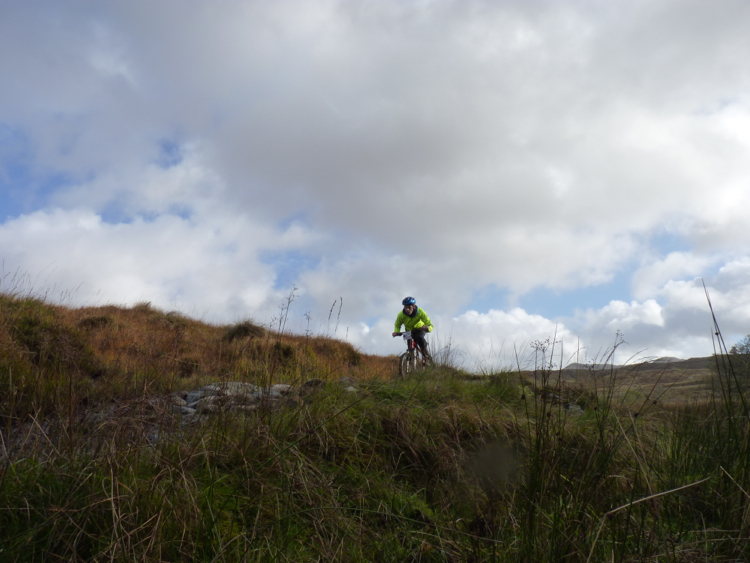 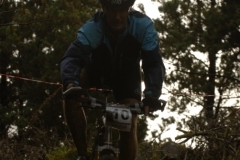 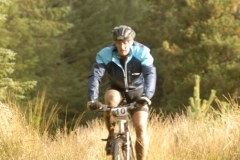 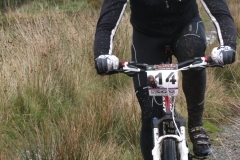 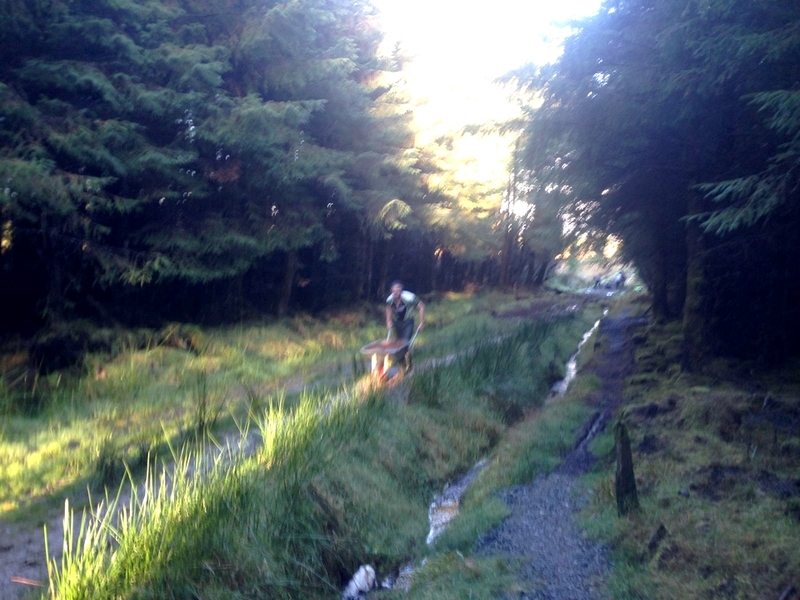 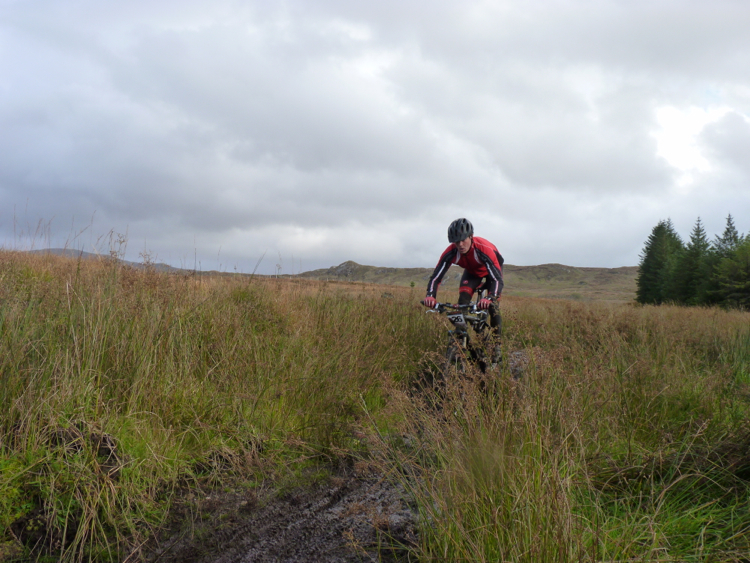 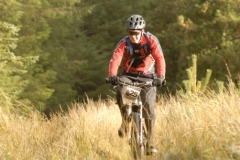 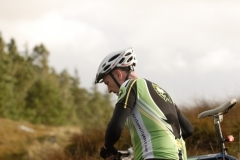 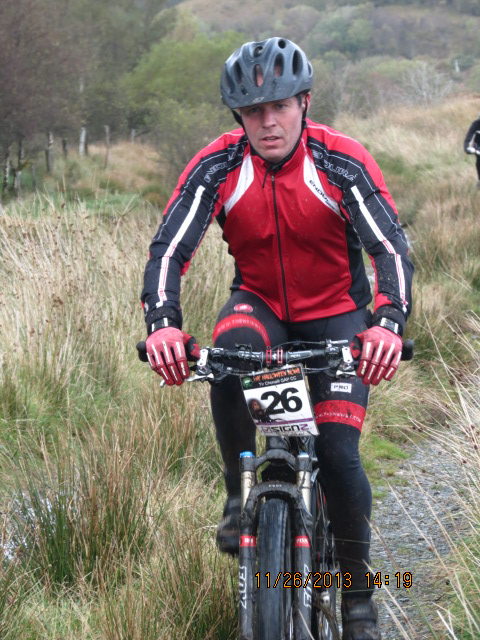 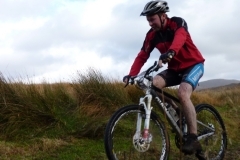 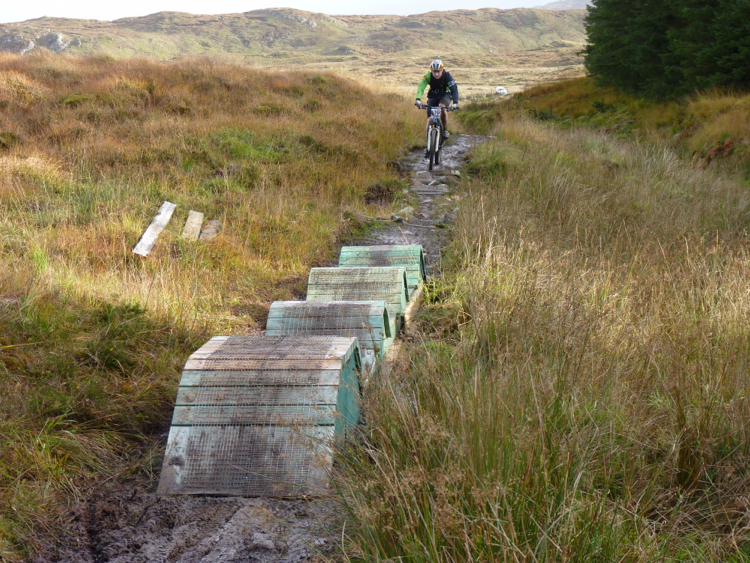 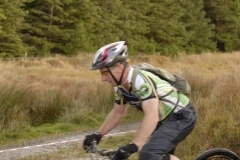 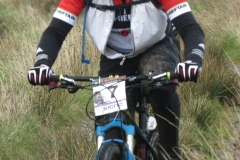 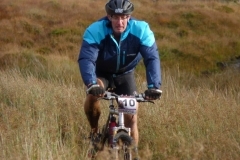 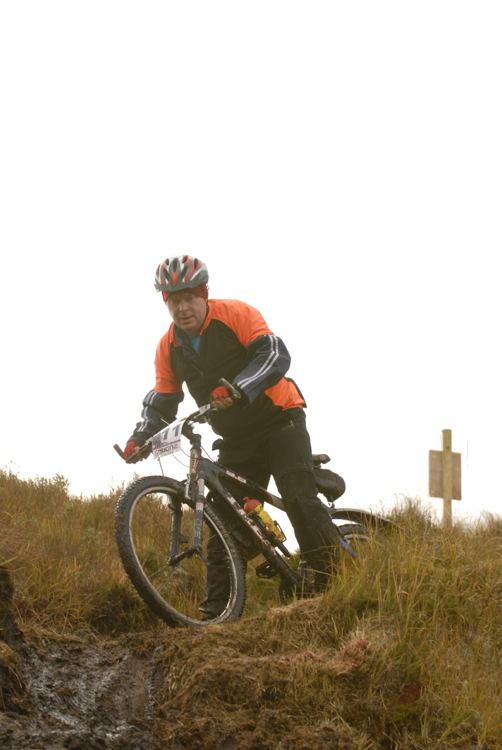 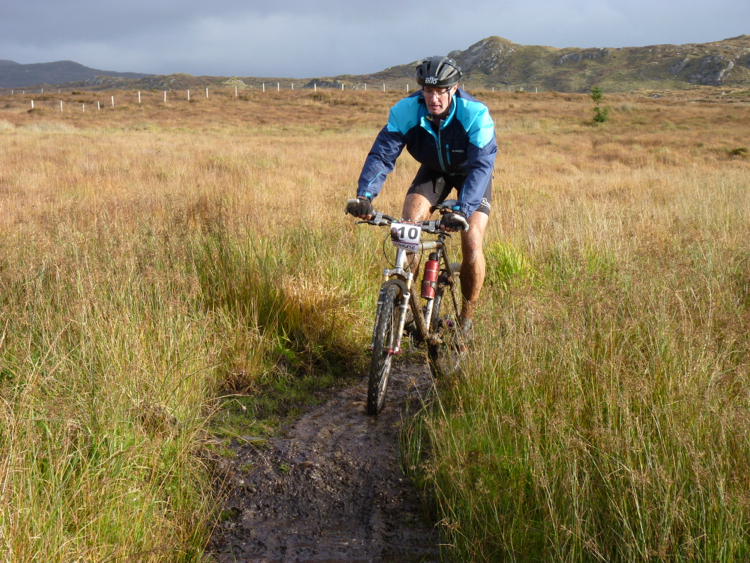 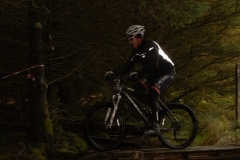 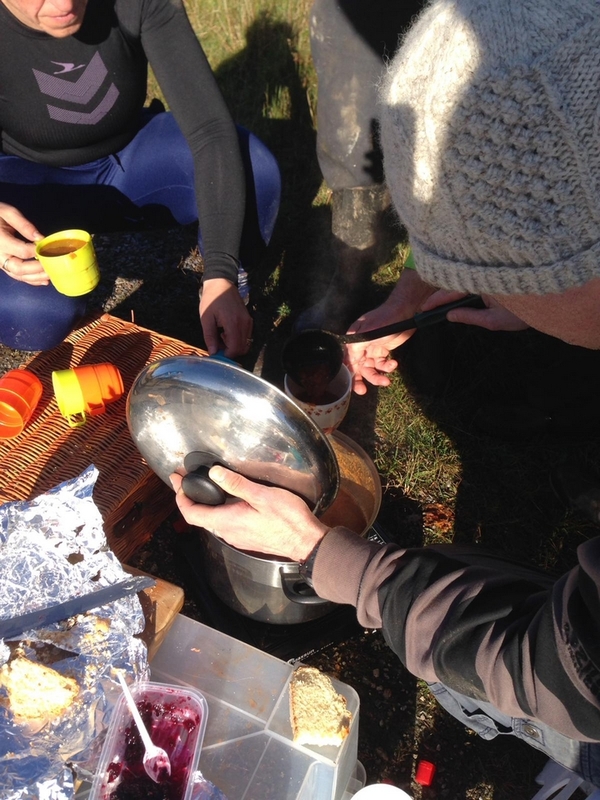 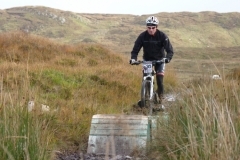 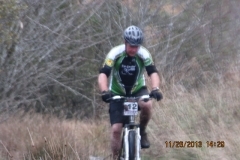 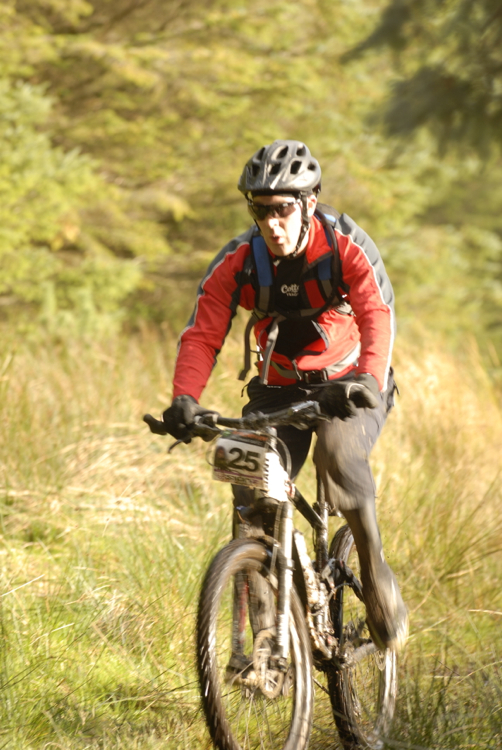 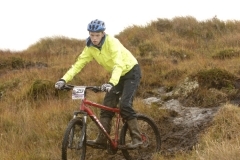 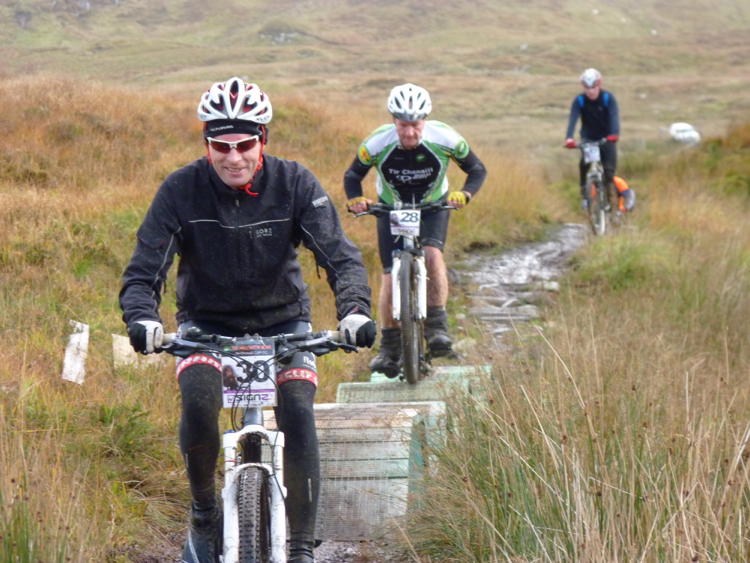 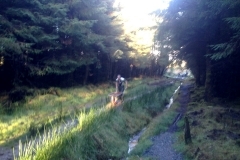 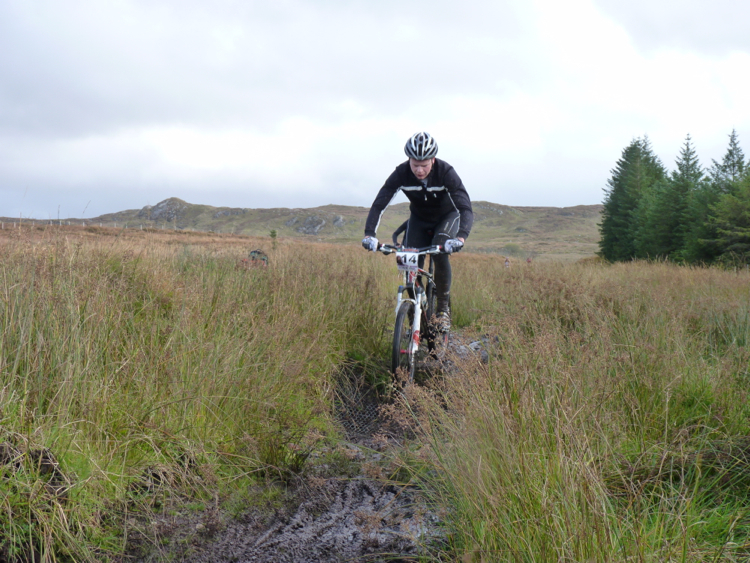 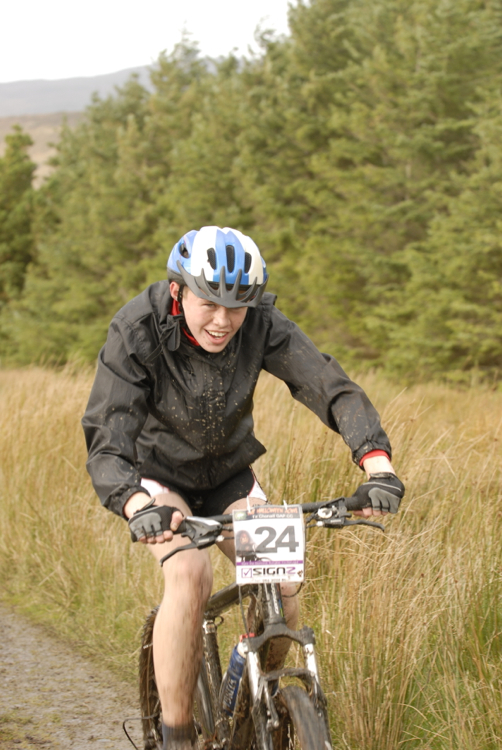 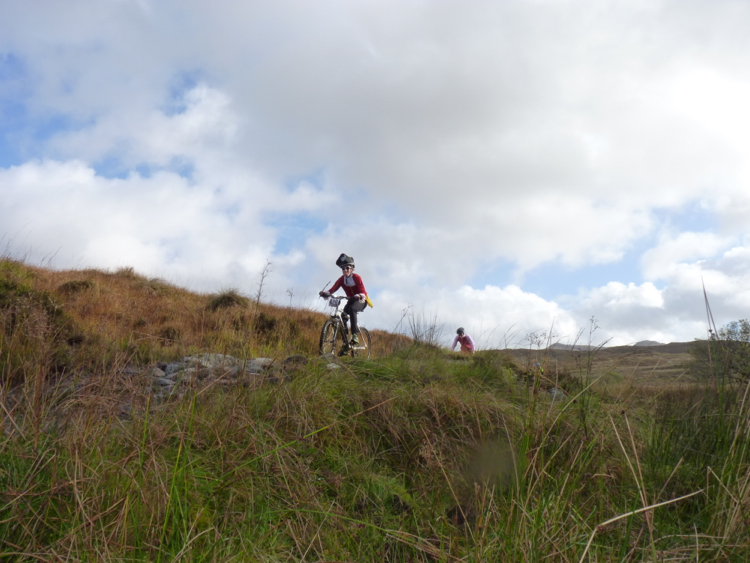 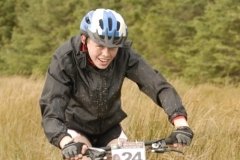 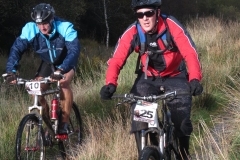 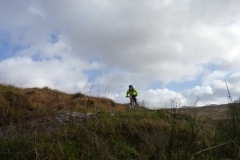 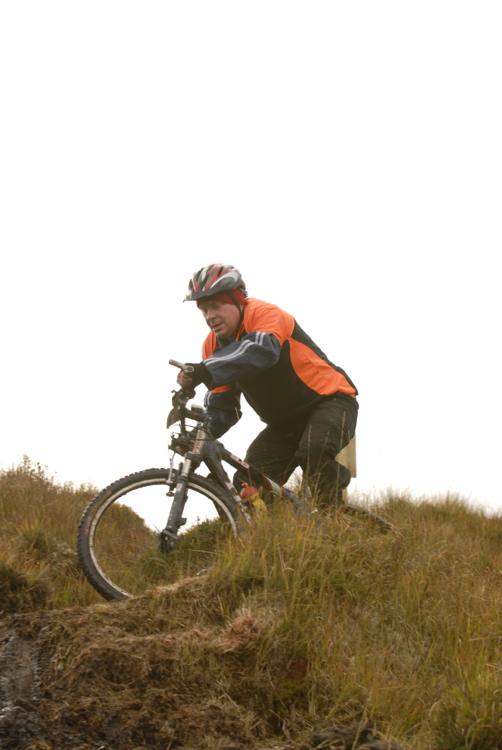 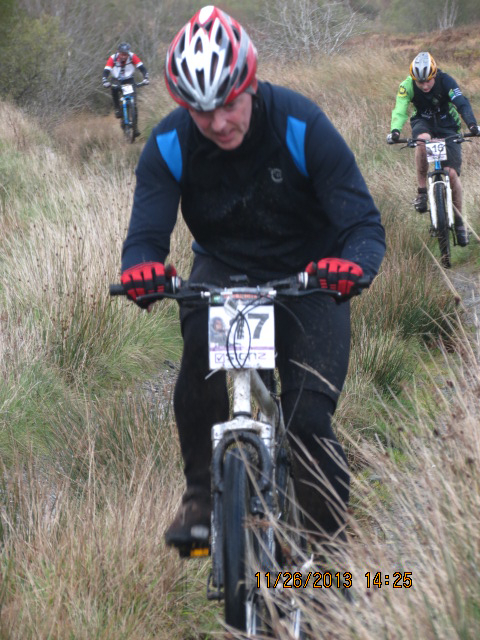 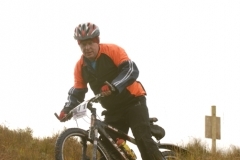 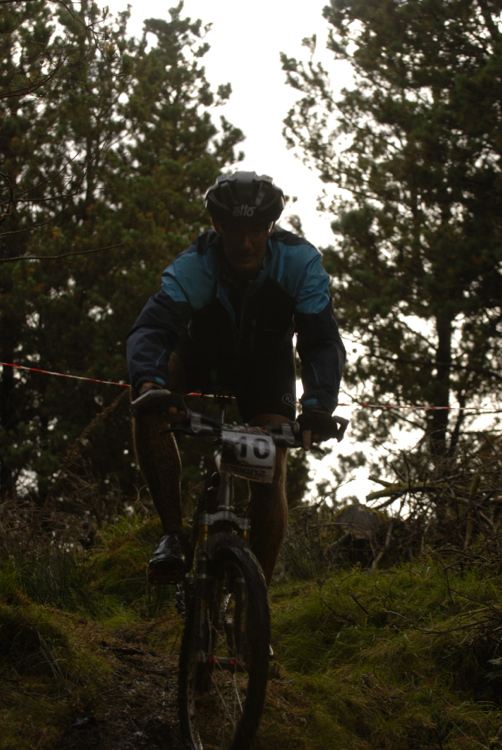 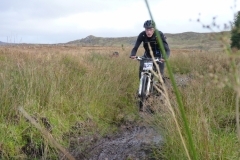 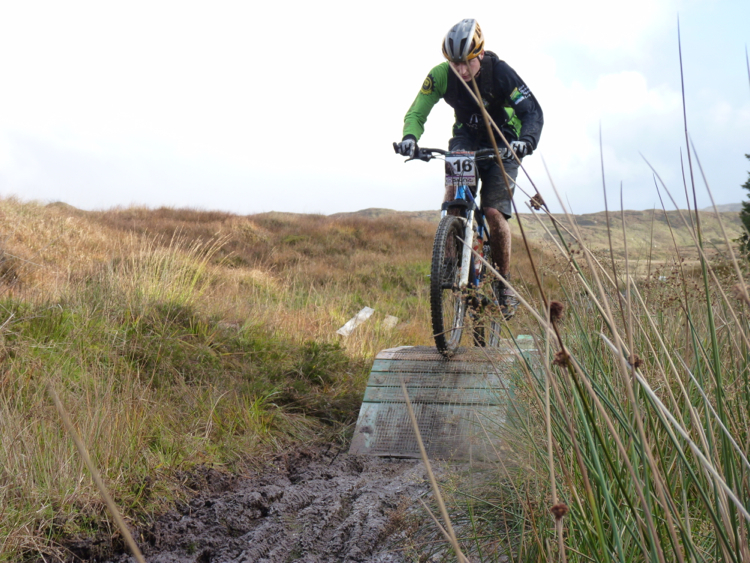 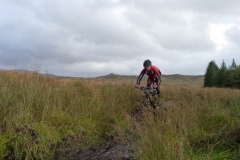 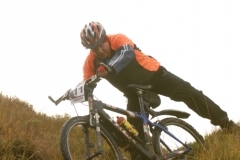 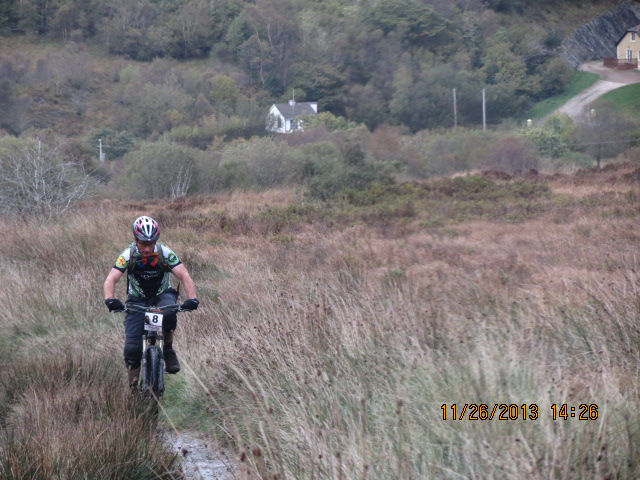 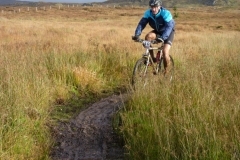 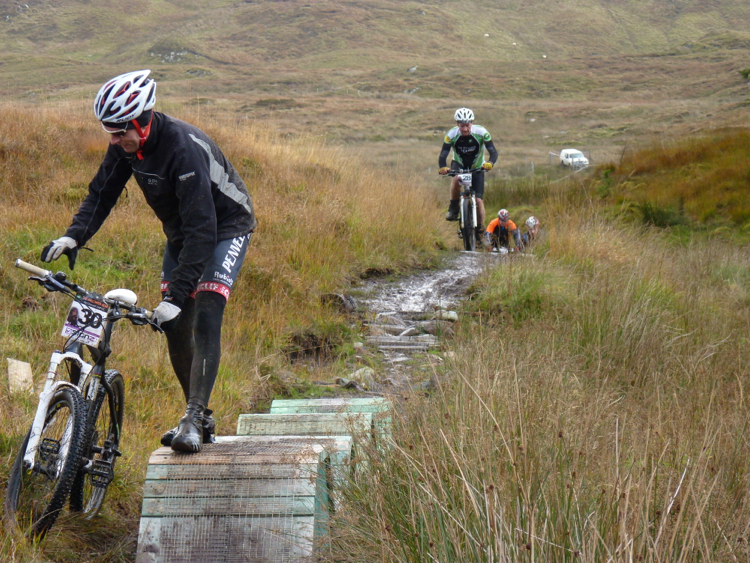 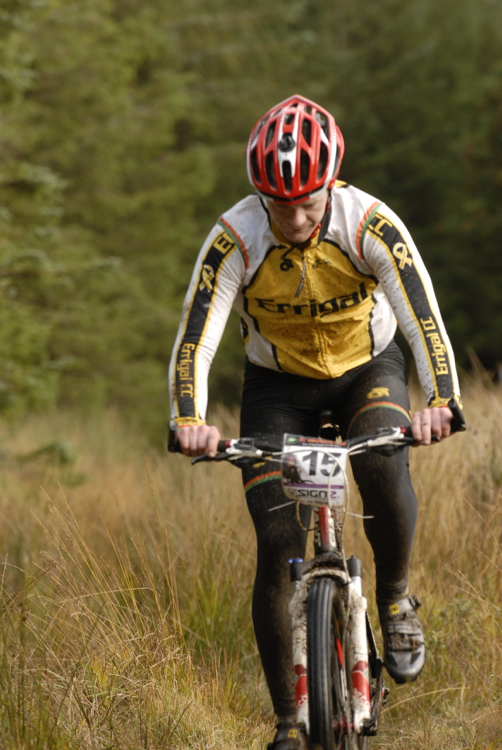 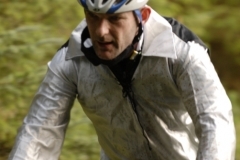 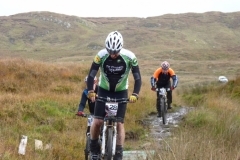 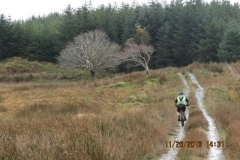 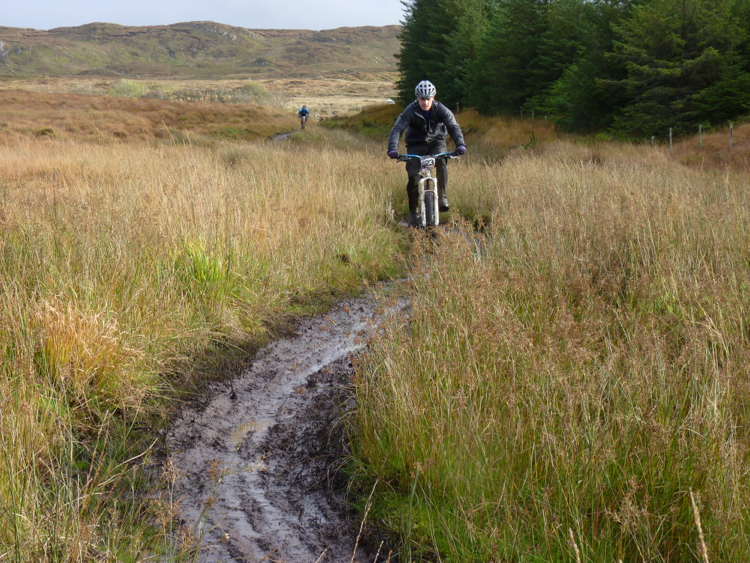 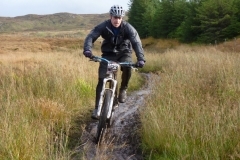 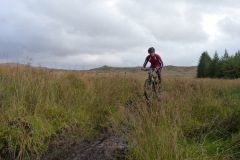 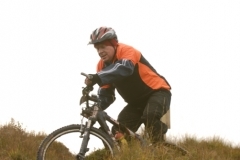 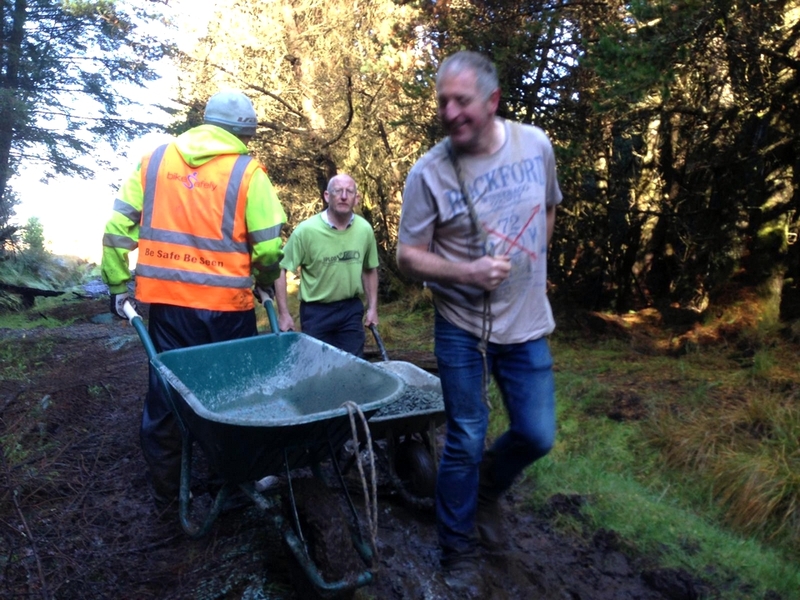 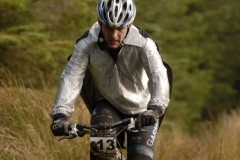 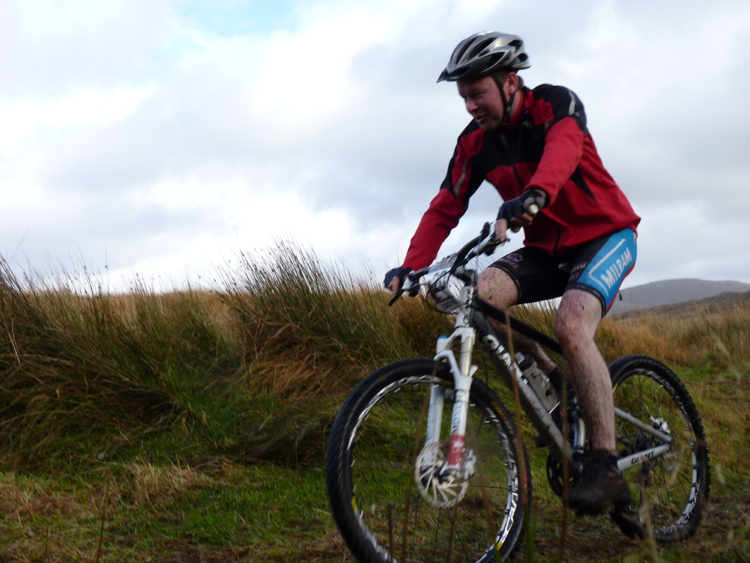 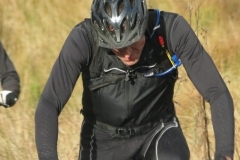 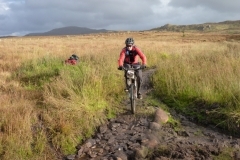 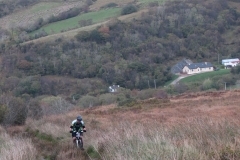 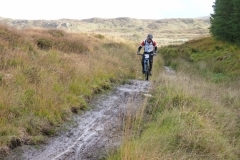 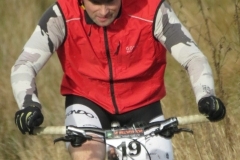 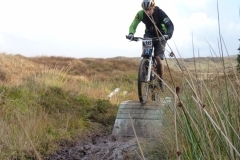 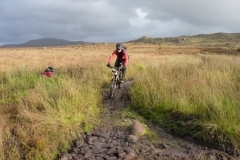 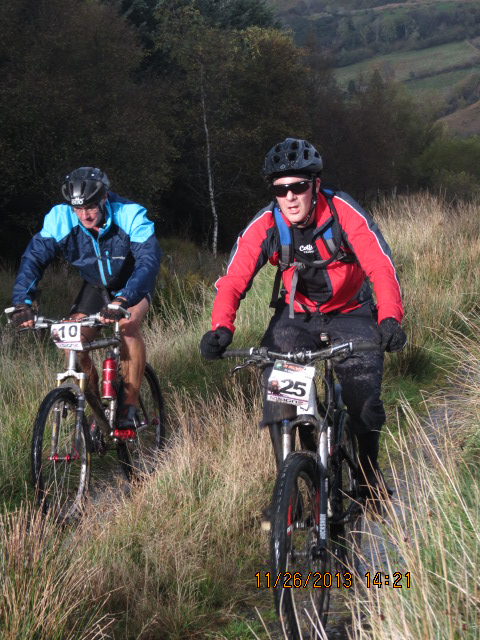 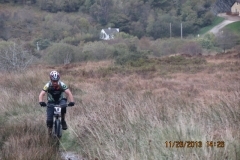 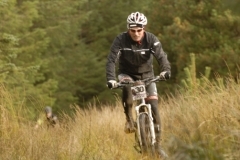 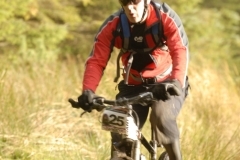 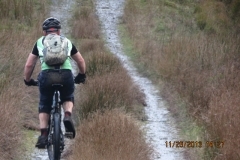 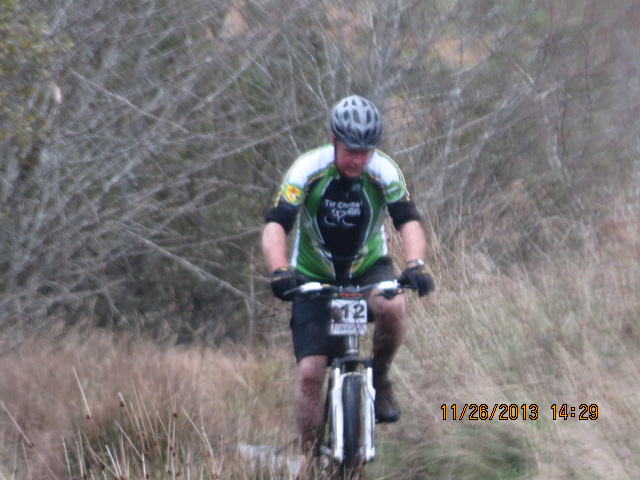 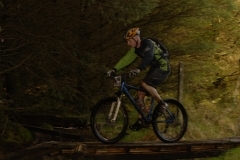 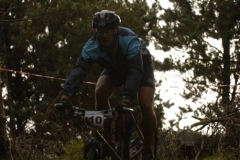 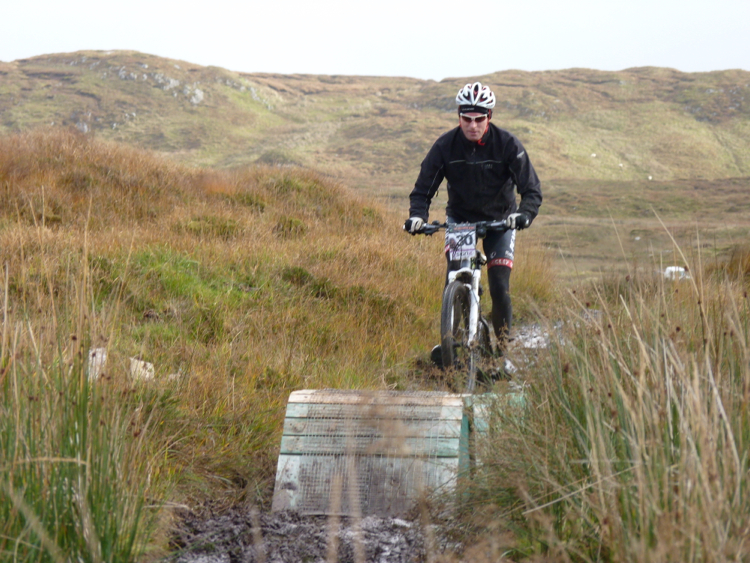 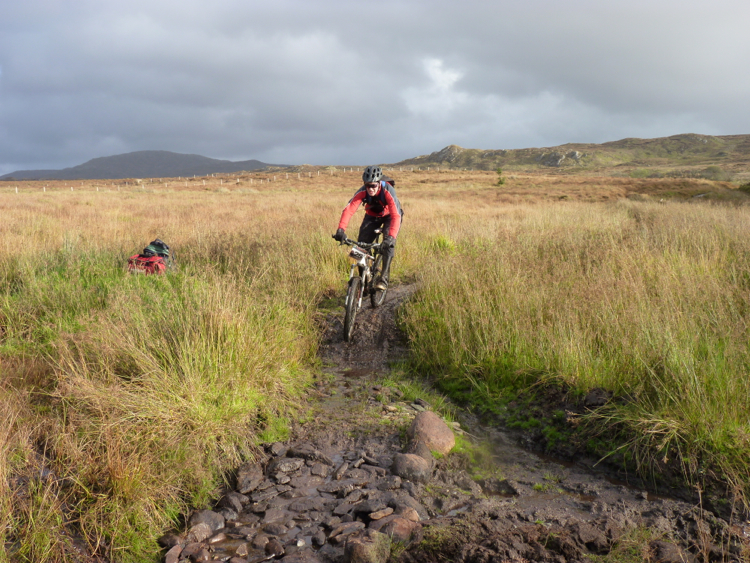 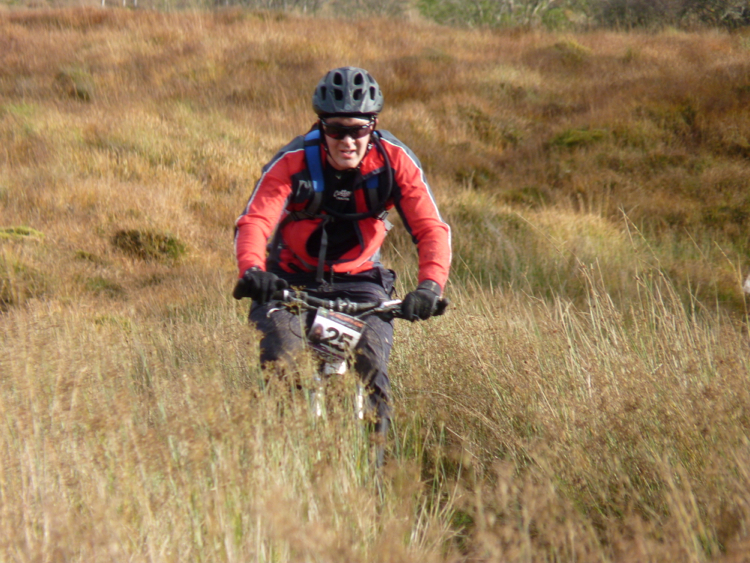 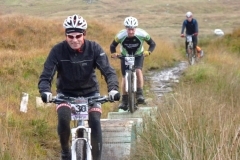 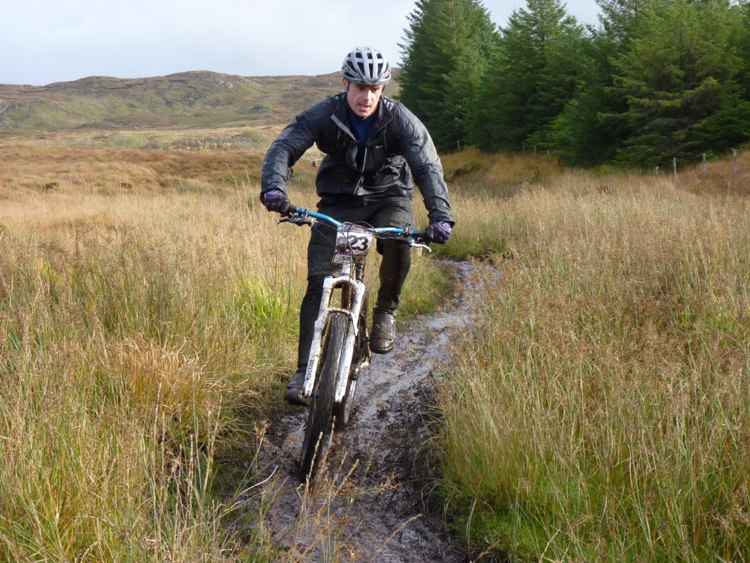 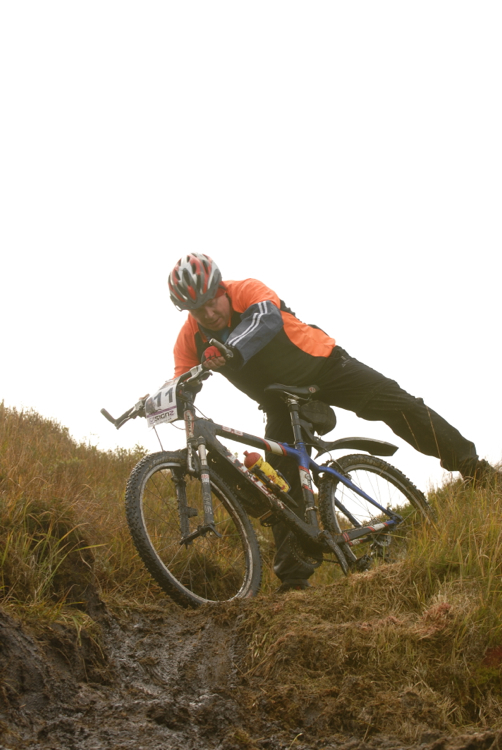 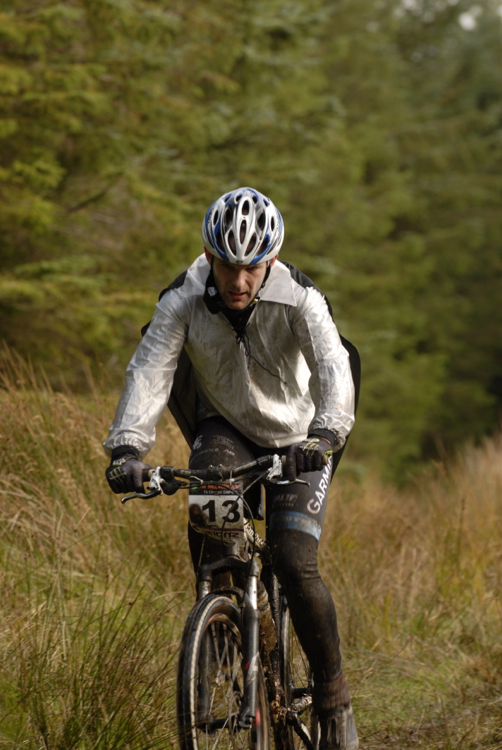 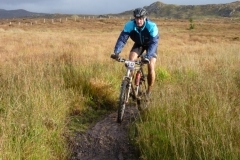 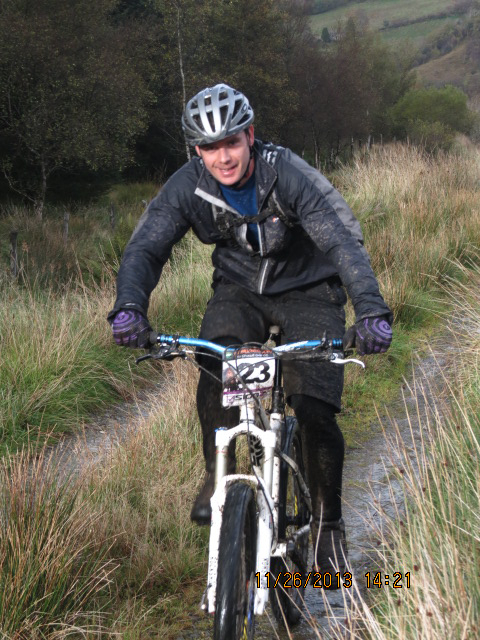 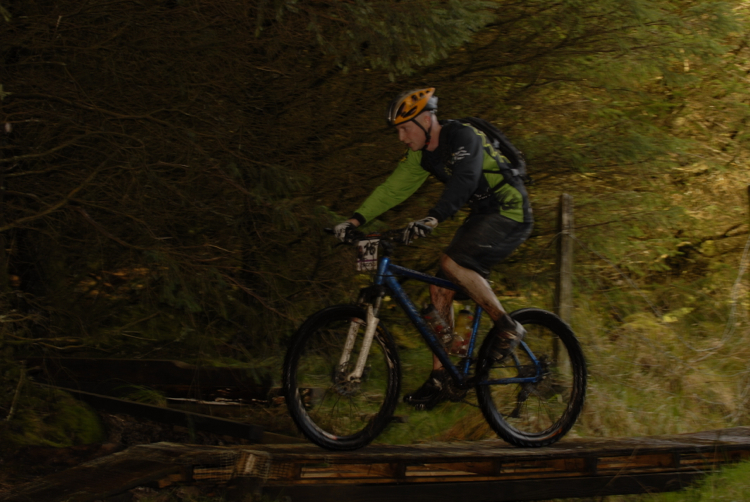 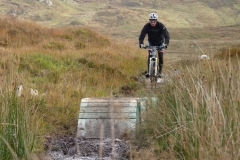 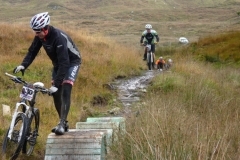 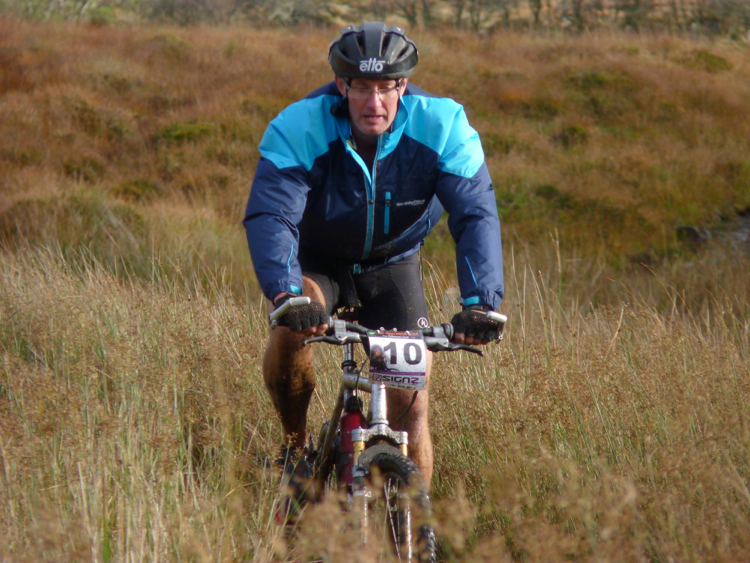 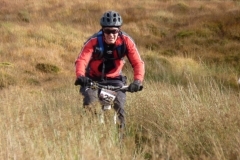 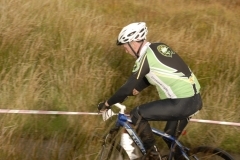 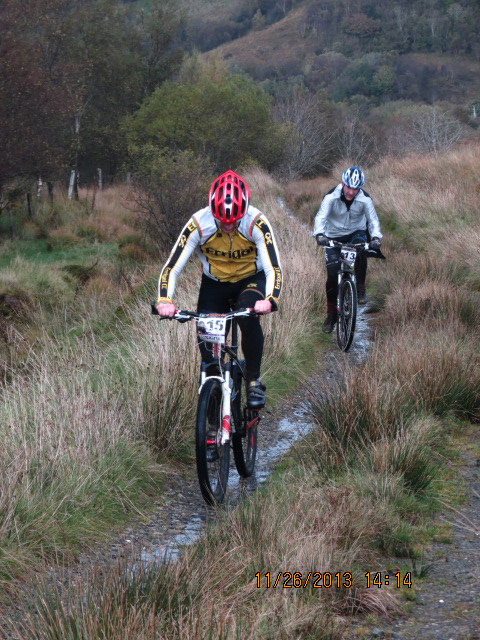 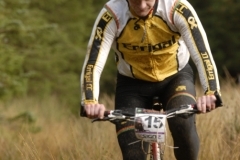 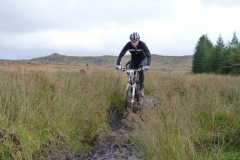 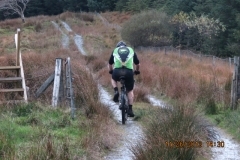 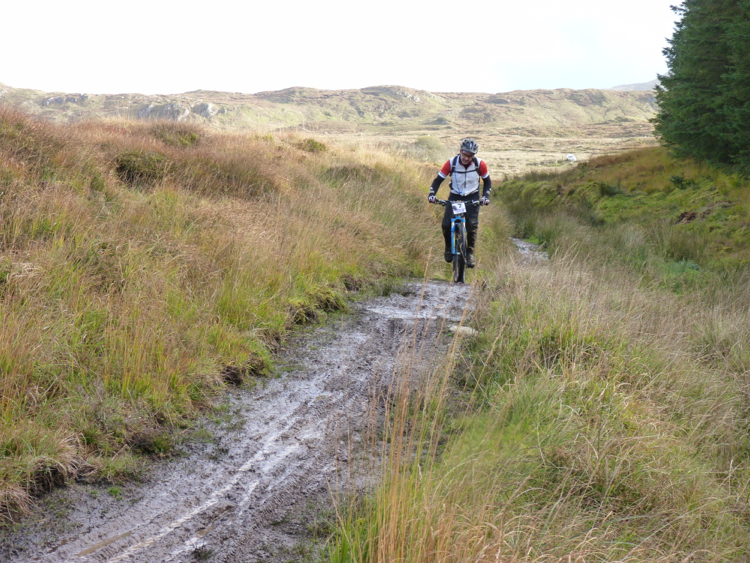 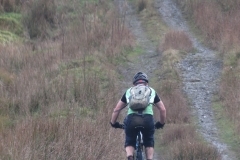 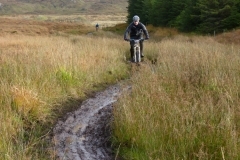 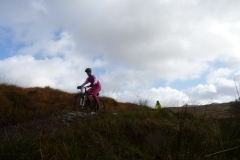 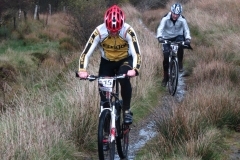 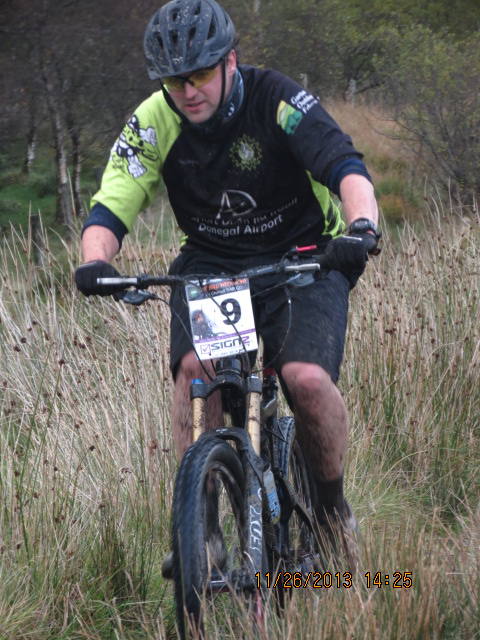 You will head out of Glenties along the Glen Road for 7km to the trail head. Turn right off the road and right again and start the climb: 2.4km of firetrack. 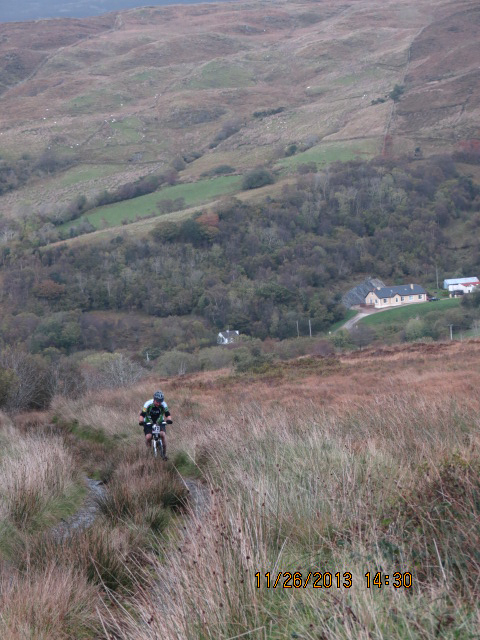 Watch out for sheep, and enjoy the views across the Bluestack Mountains, then a nice gentle descent to the old ruined cottage. 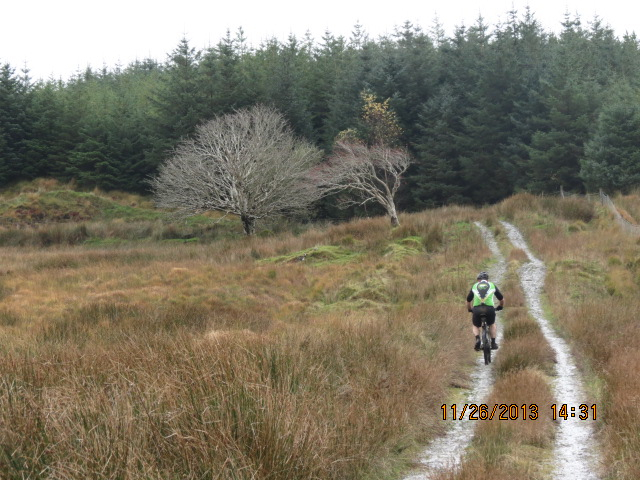 Back on the track and you will cycle past the stunningly beautiful Lough Anna (pictured above) before turning back into the forestry again and “Hugh’s Hollow”, a lovely wee technical section. 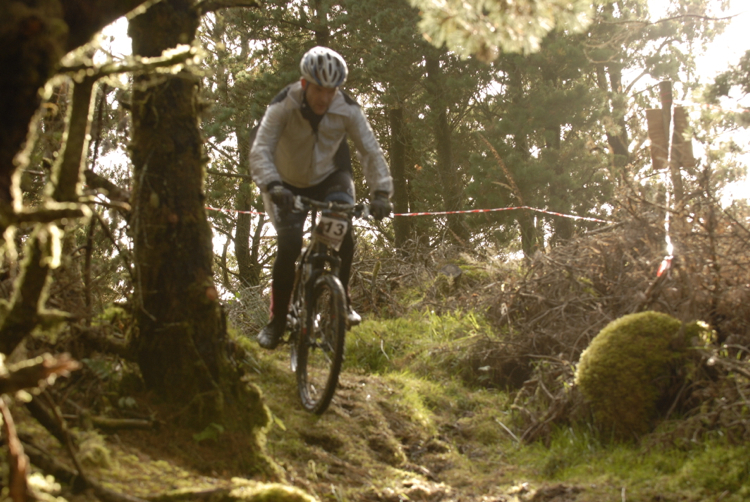 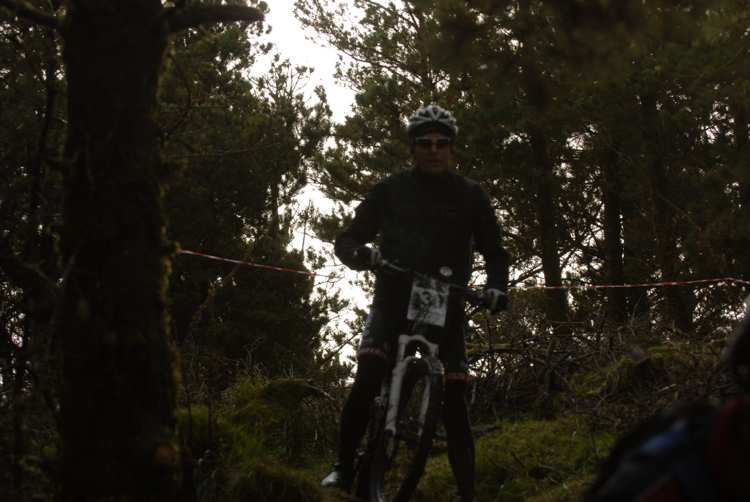 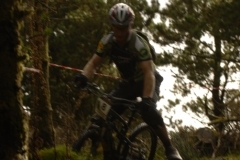 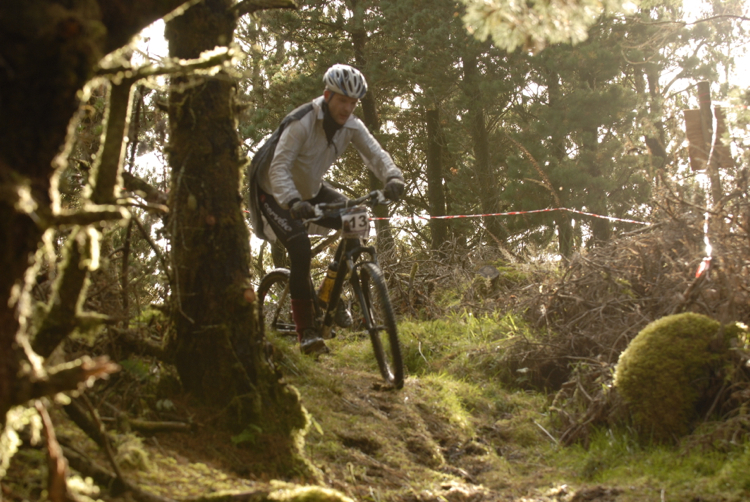 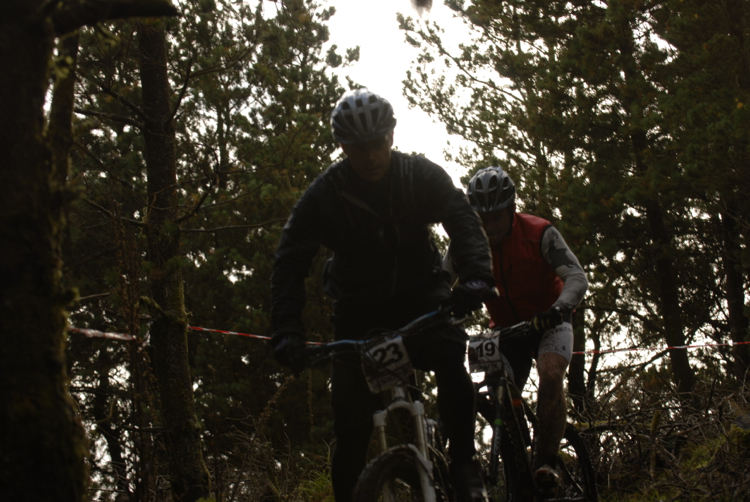 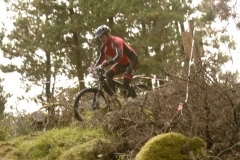 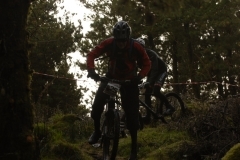 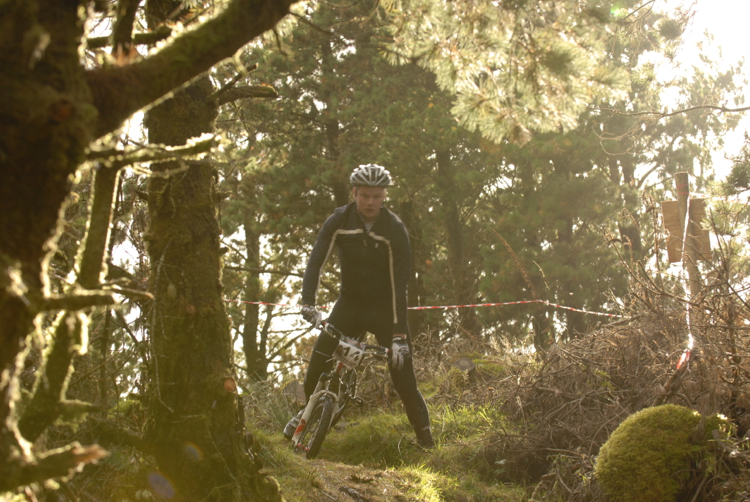 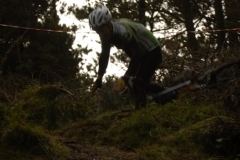 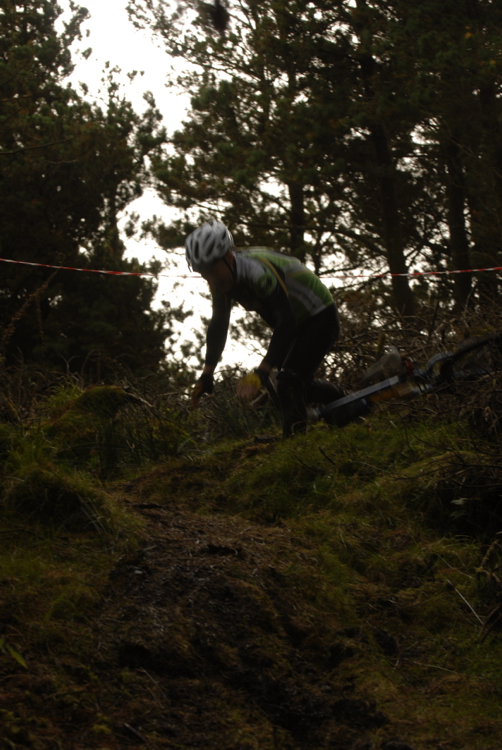 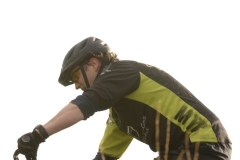 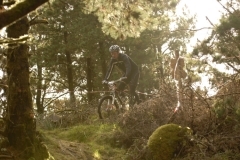 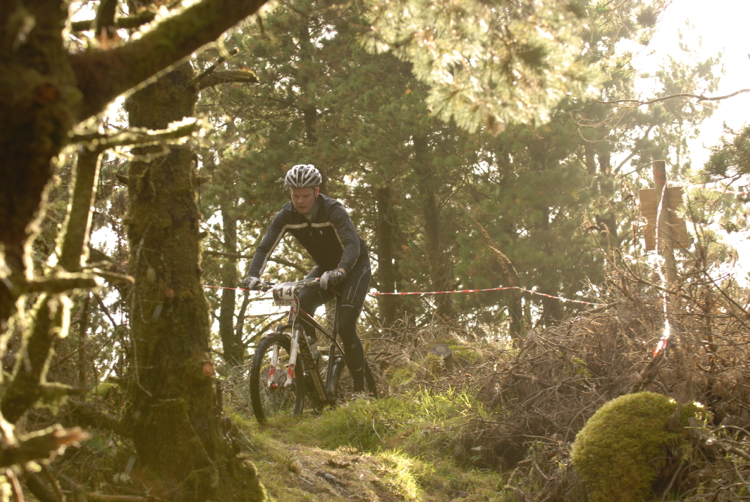 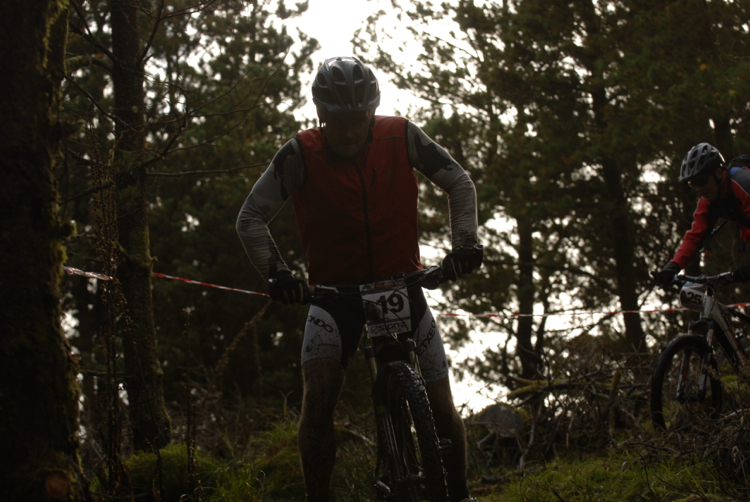 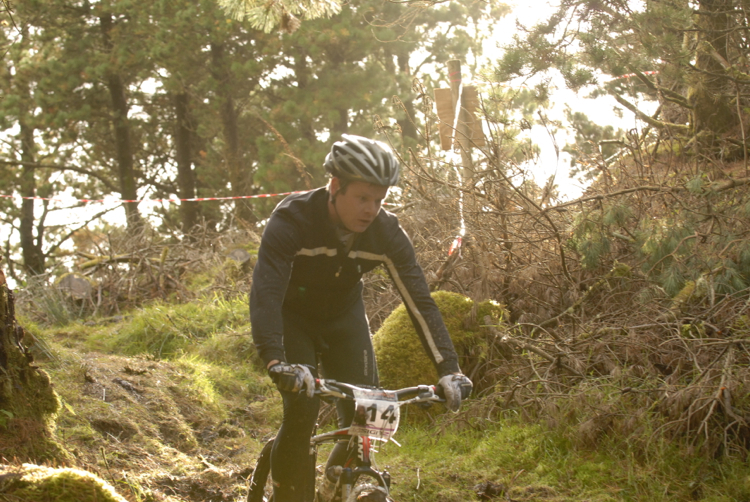 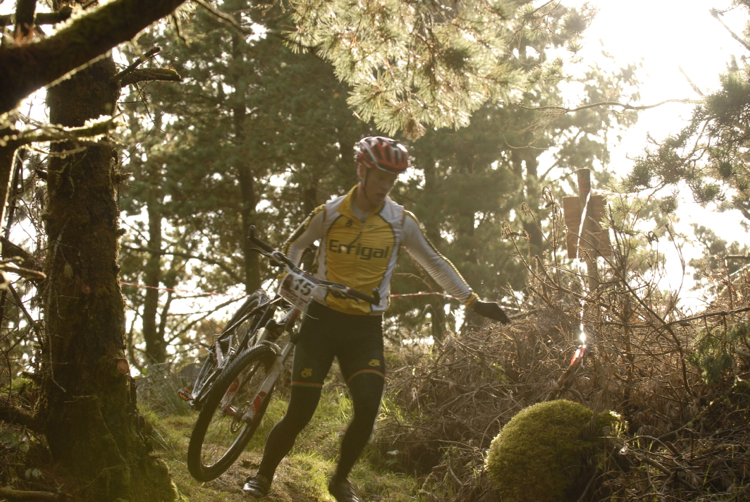 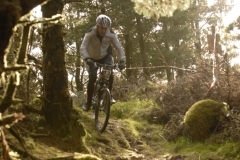 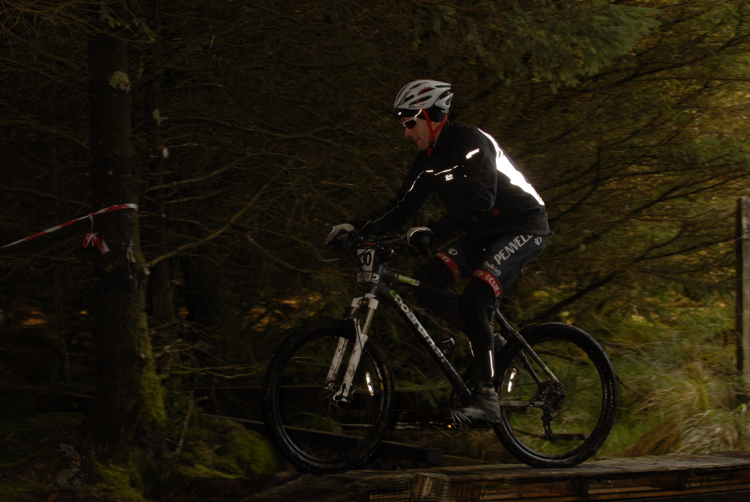 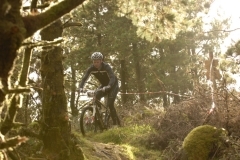 Back out into daylight again and you’ll put in a loop on top of the hill, just for the craic, and then back into the forest and a natural pump track of tree roots and ditches. 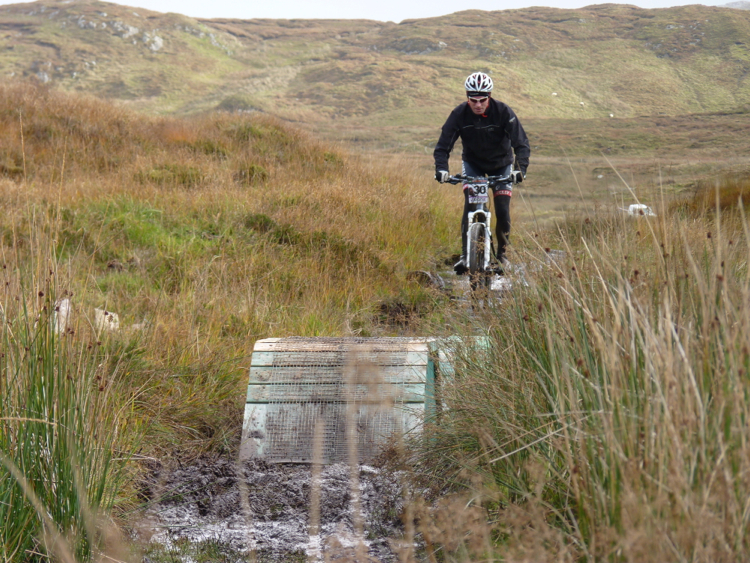 We challenge you not to put your foot down in here. 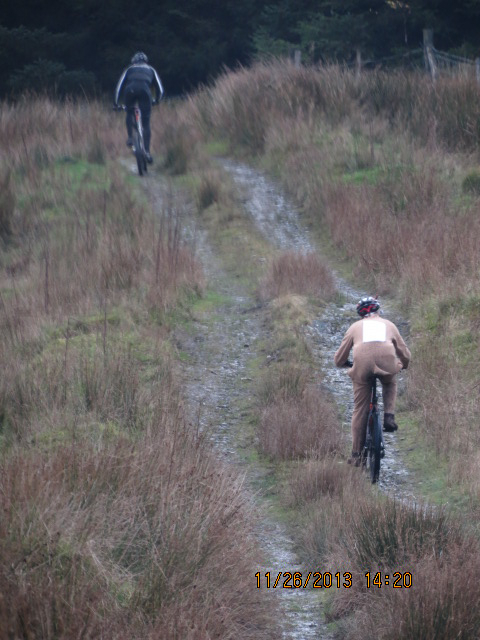 When you emerge there is just the table top and jump and the exciting descent. 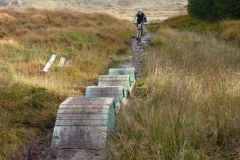 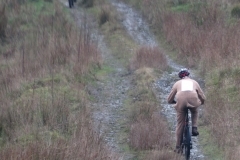 At the bottom, the two lappers turn right and head back to the trail head, whilst the one lappers will turn left towards home. 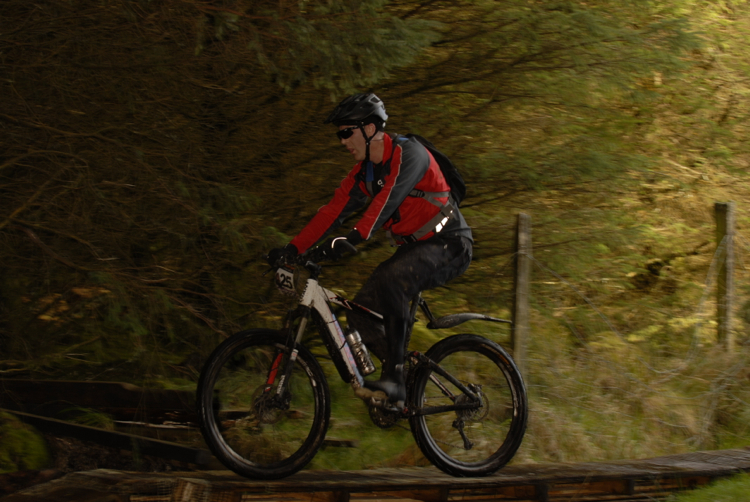 One last challenge left, and that’s to negotiate the narrow footbridge at Meenahalla. 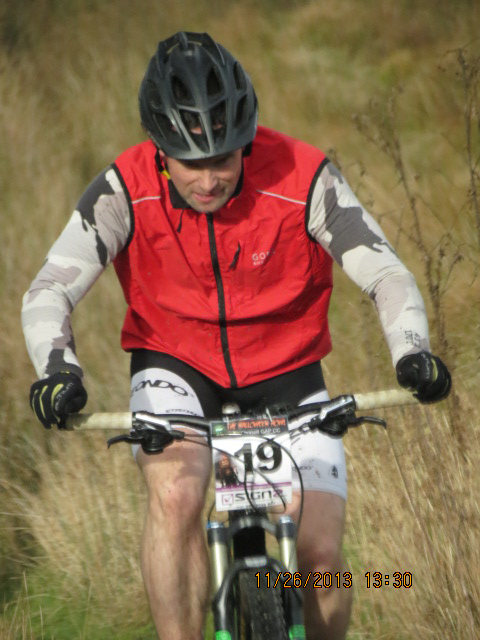 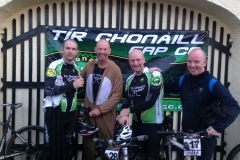 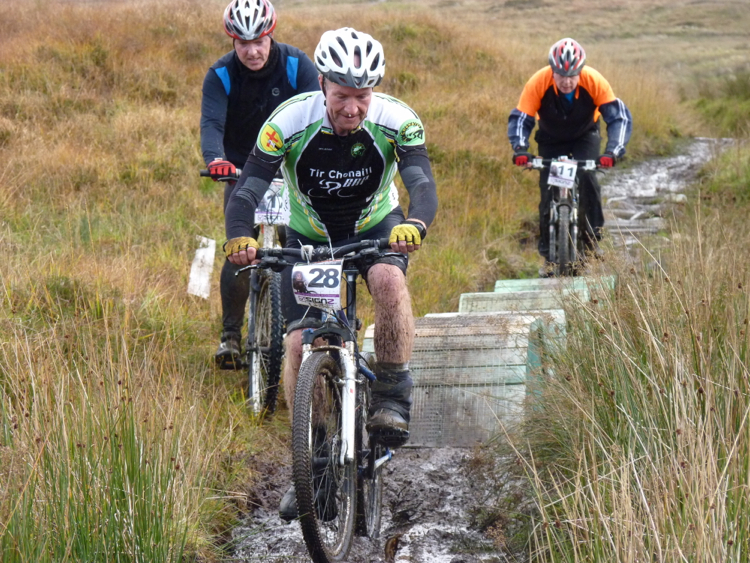 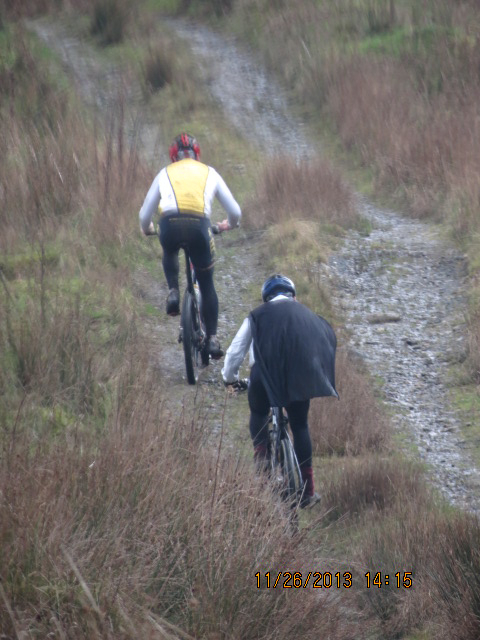 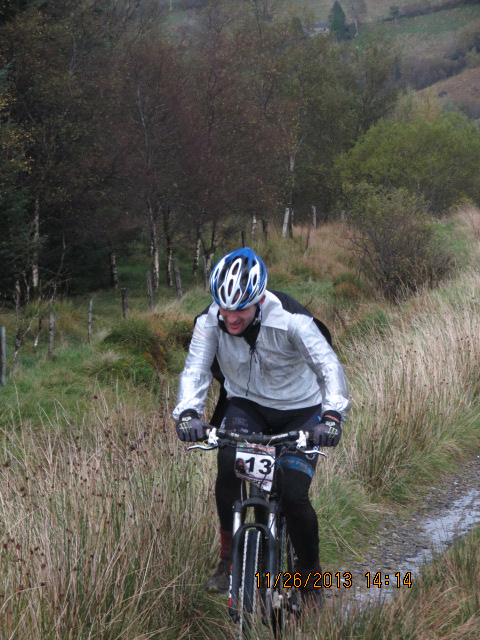 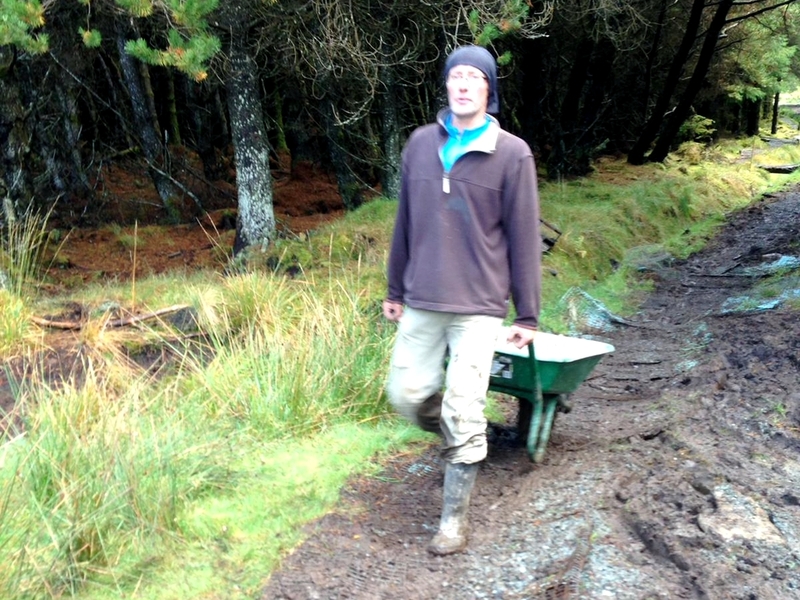 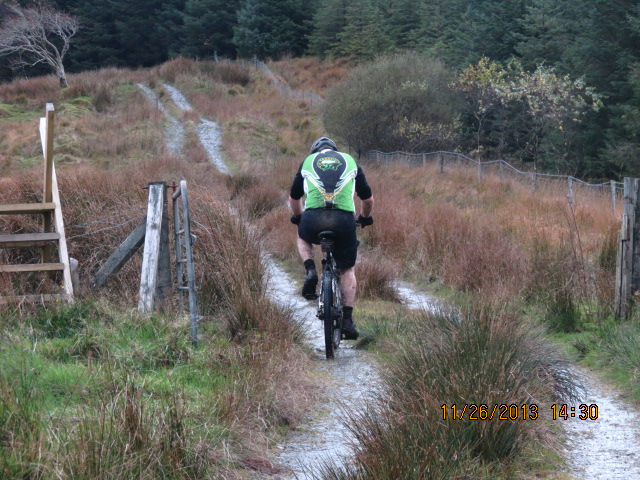 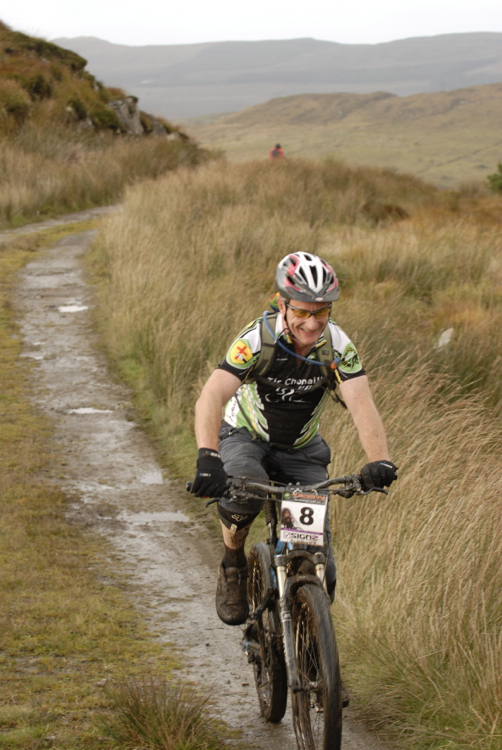 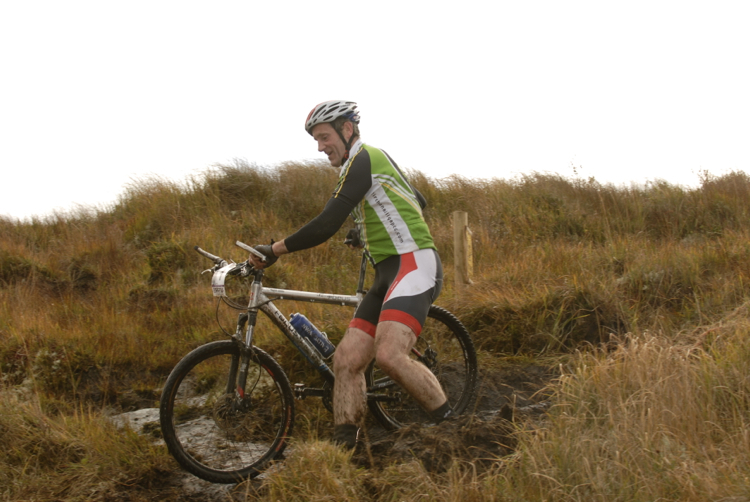 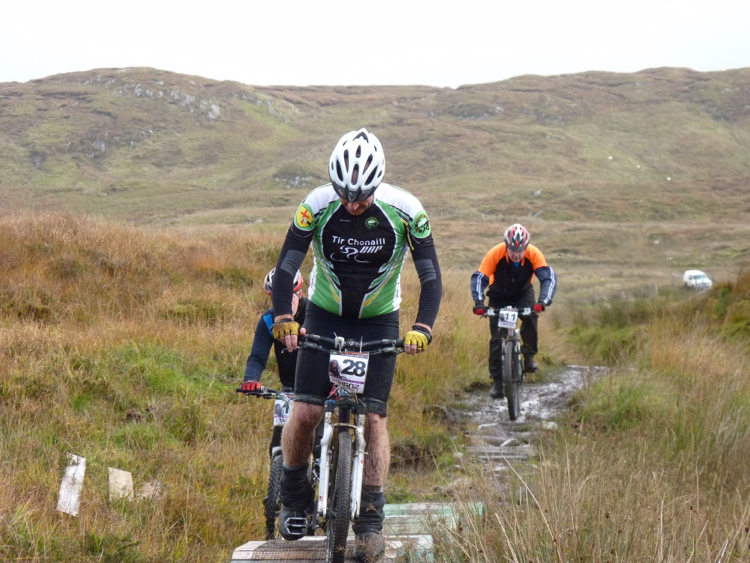 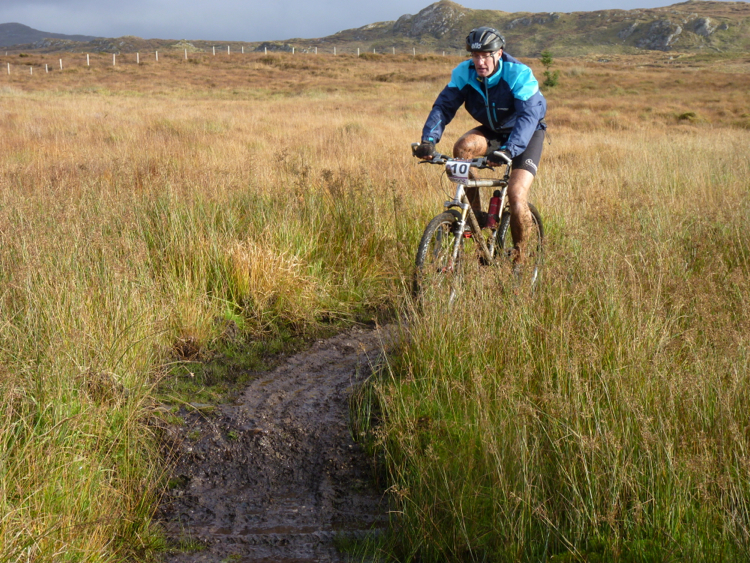 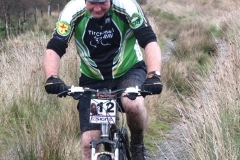 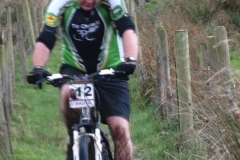 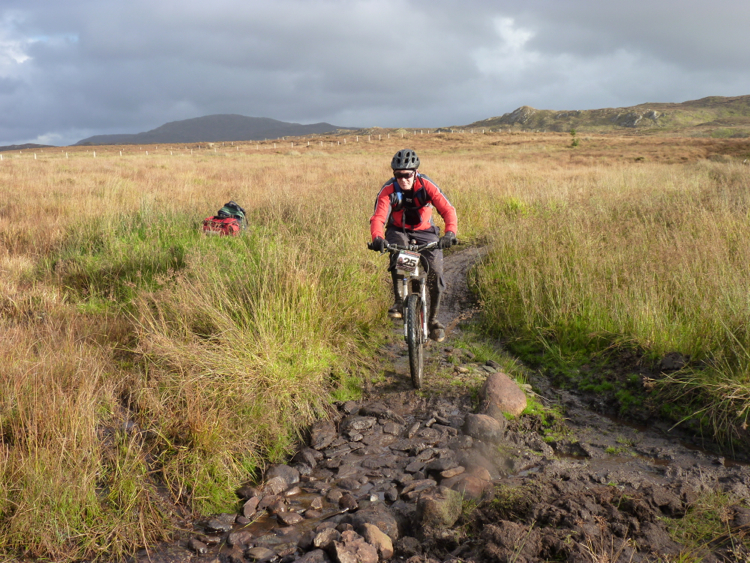 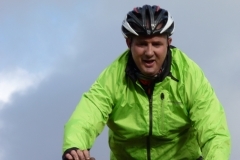 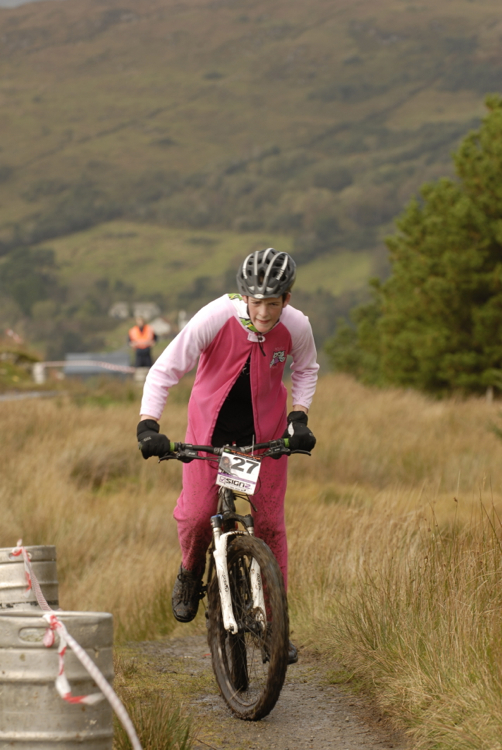 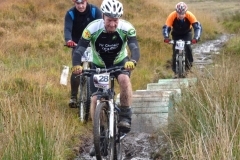 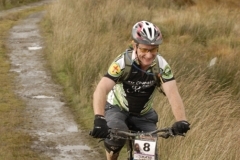 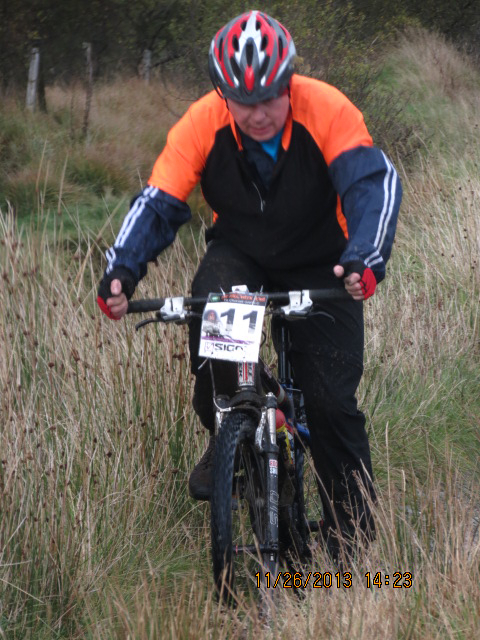 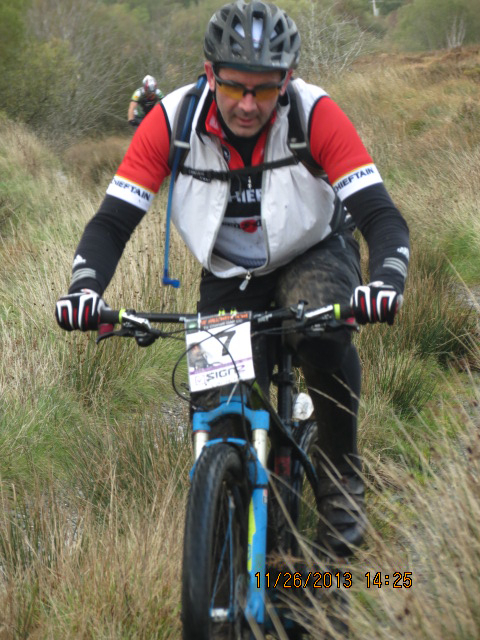 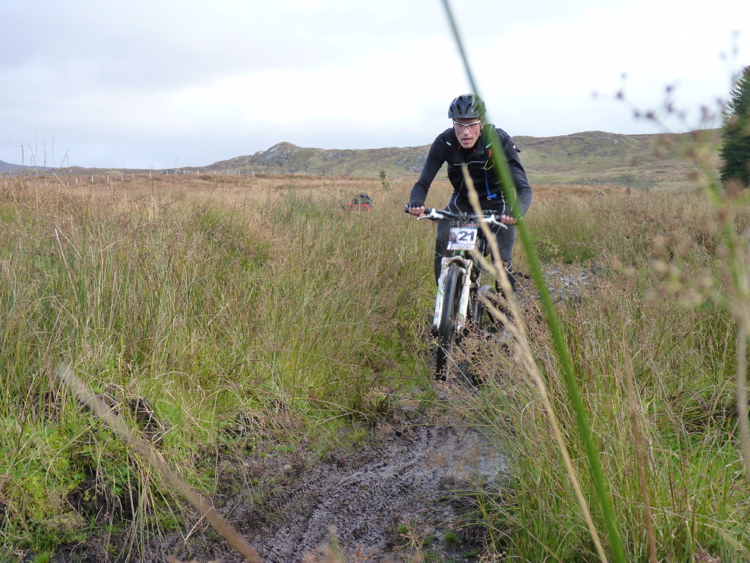 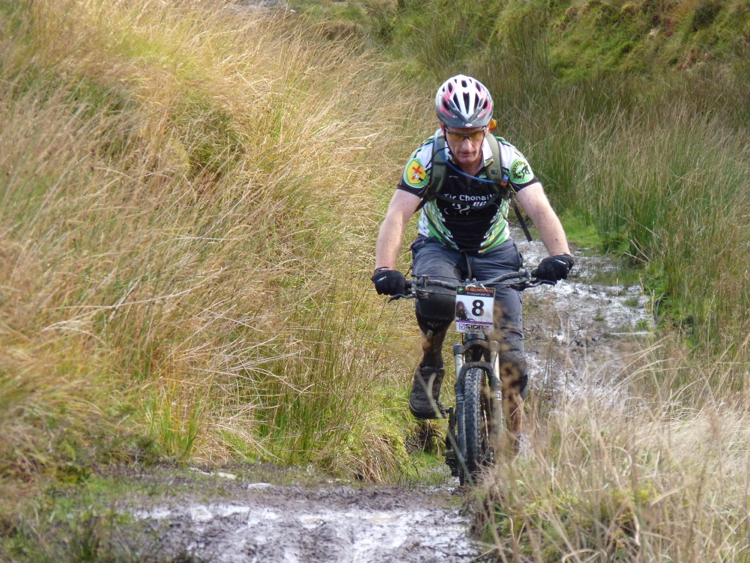 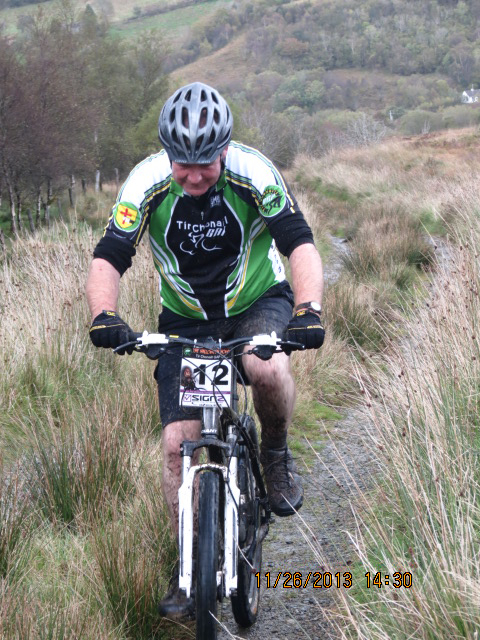 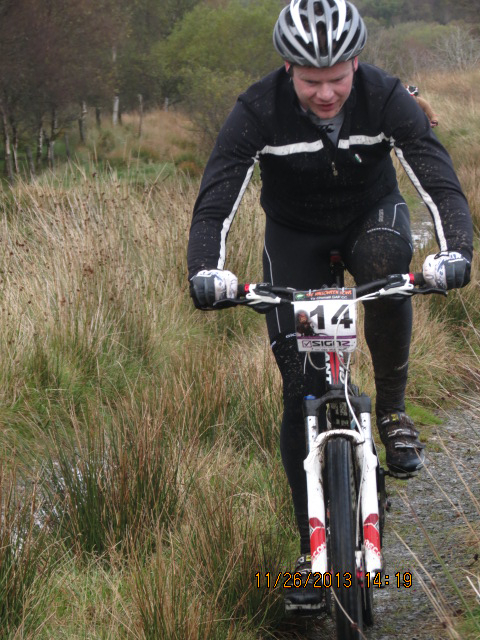 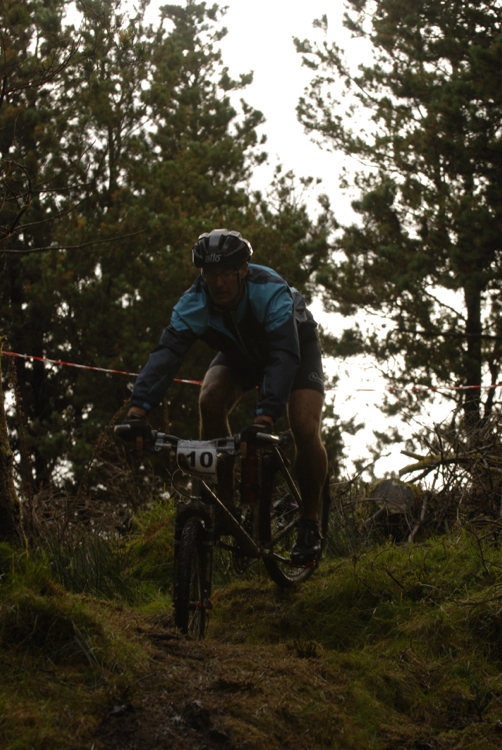 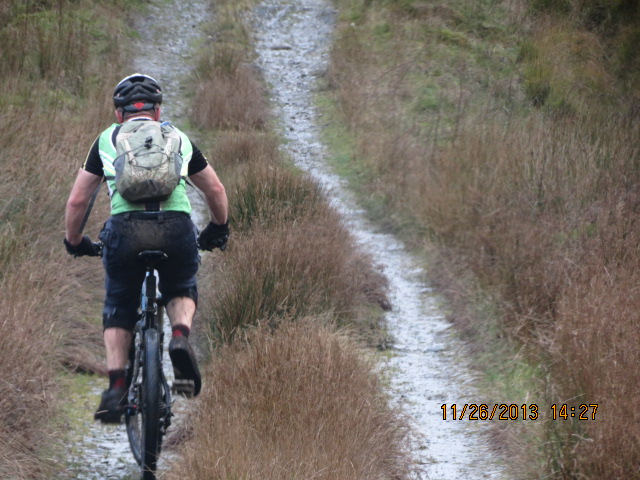 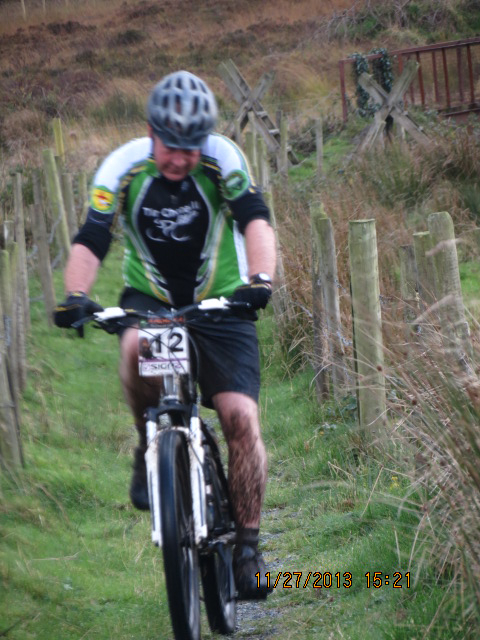 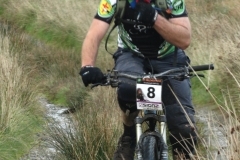 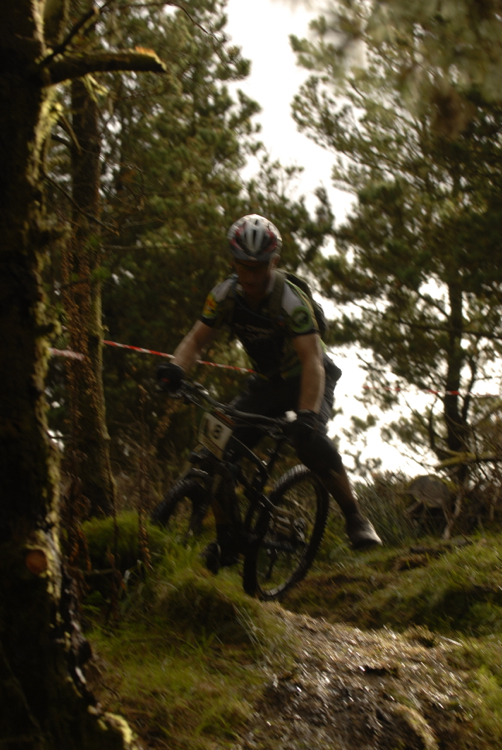 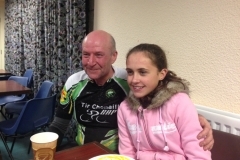 Back on tarmac there is one last climb – it’s not steep unless you’ve got a lap of the trail in your legs – and back to Glenties for refreshments. 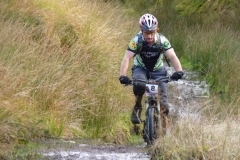 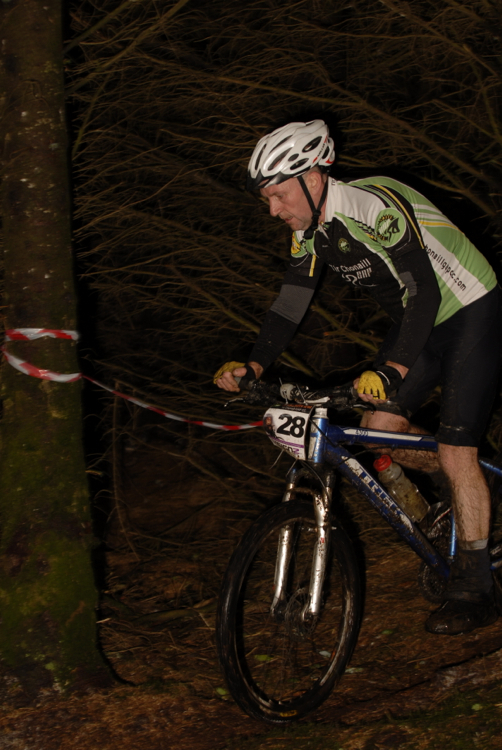 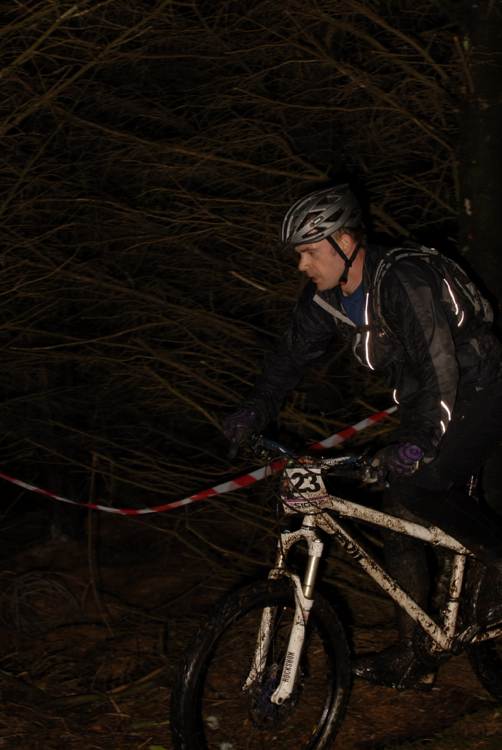 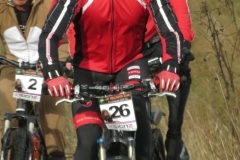 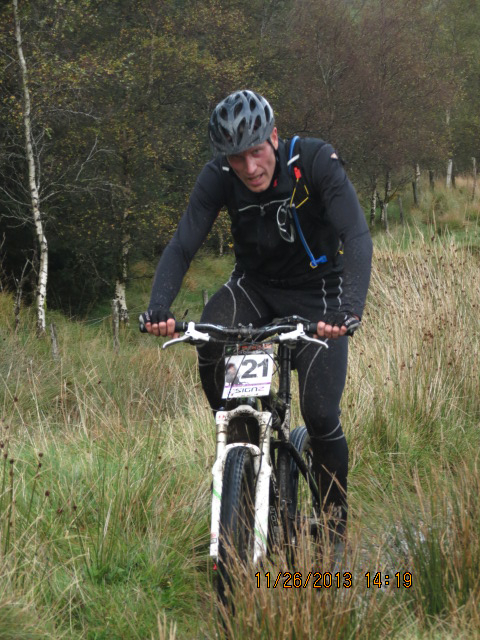 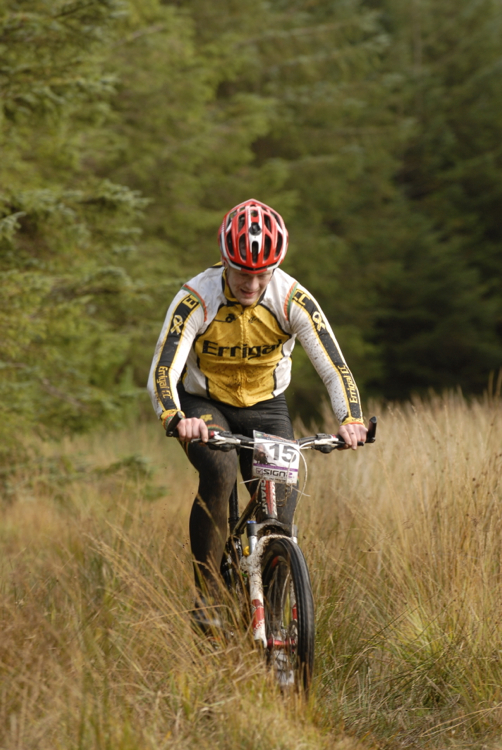 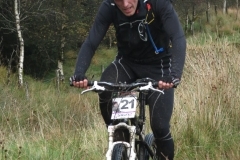 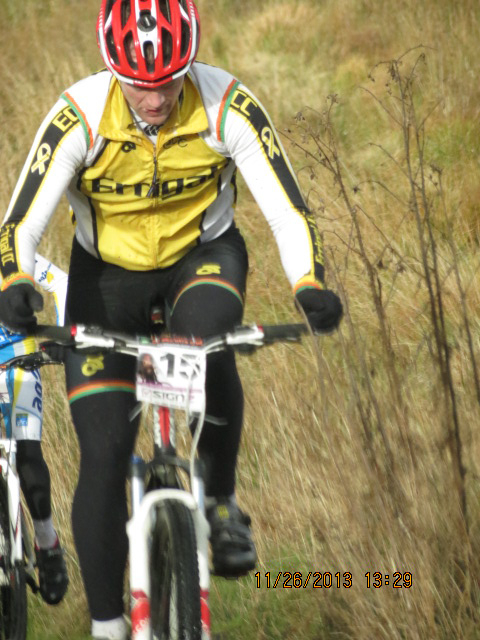 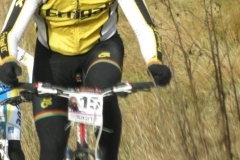 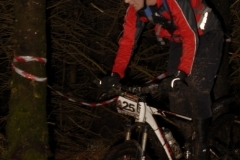 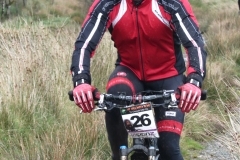 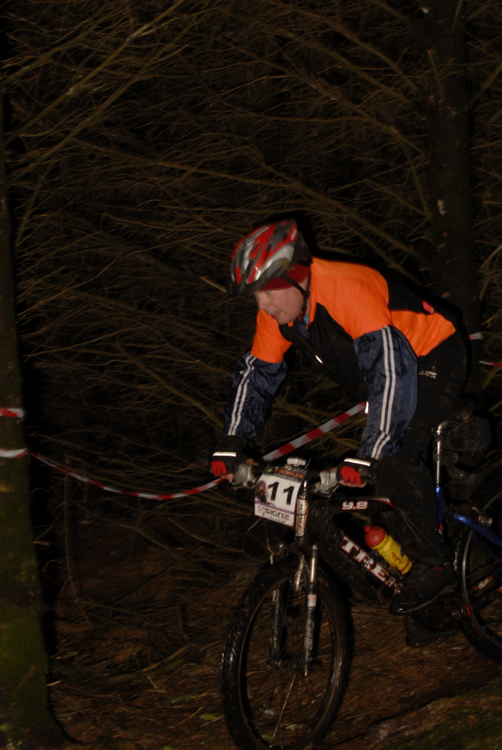 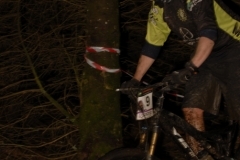 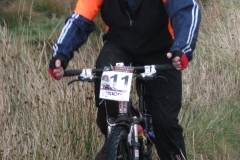 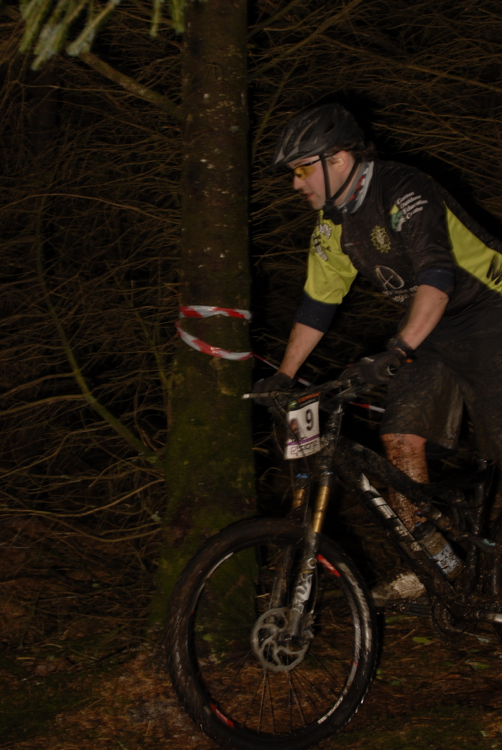 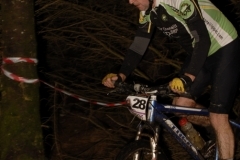 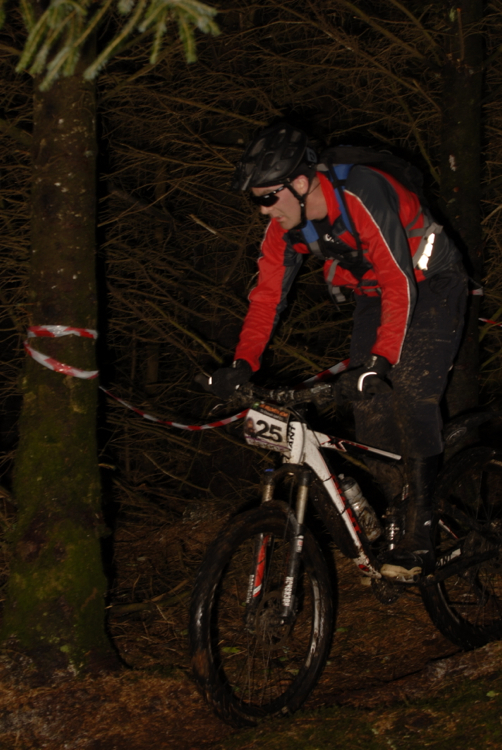 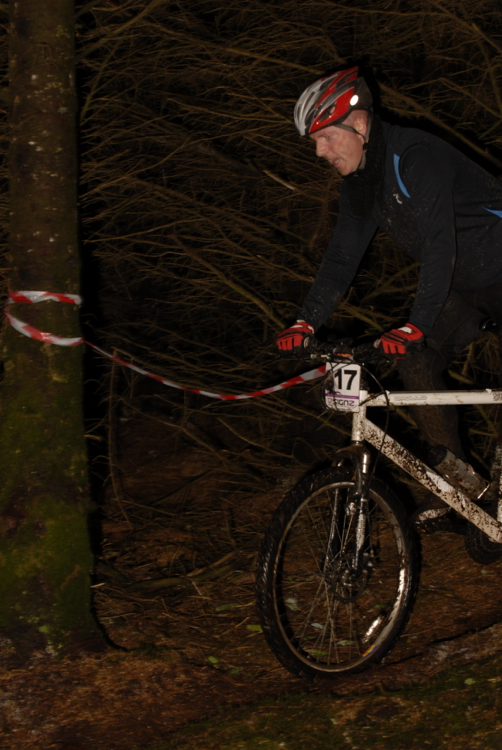 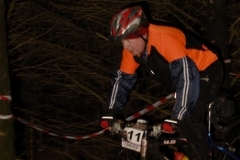 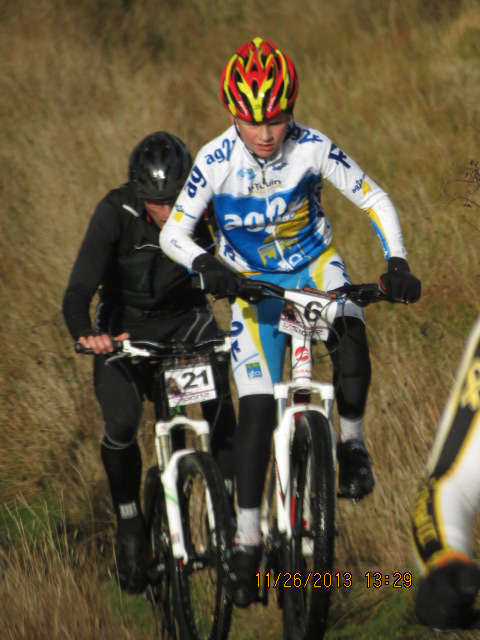 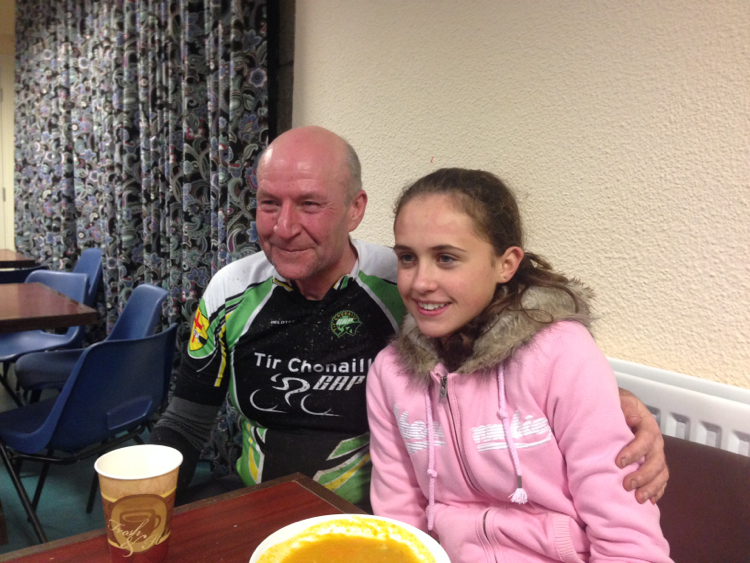 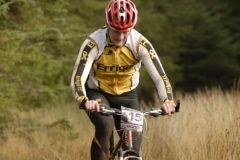 It’s been a while since we ran the event but we do have some photos of previous events. 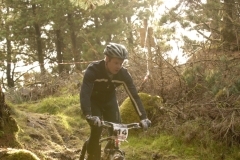 Check them out and have a good laugh at your technique back then. 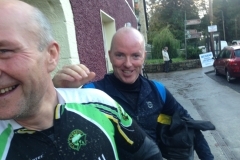 And how much hair some of you used to have! 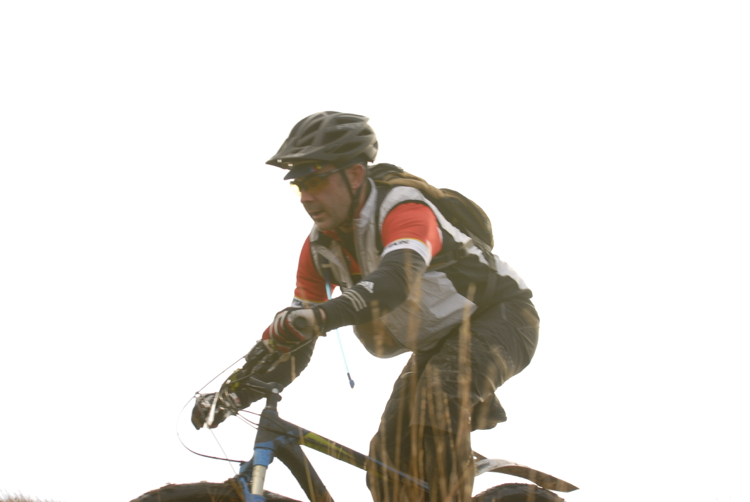 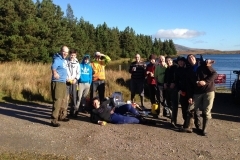 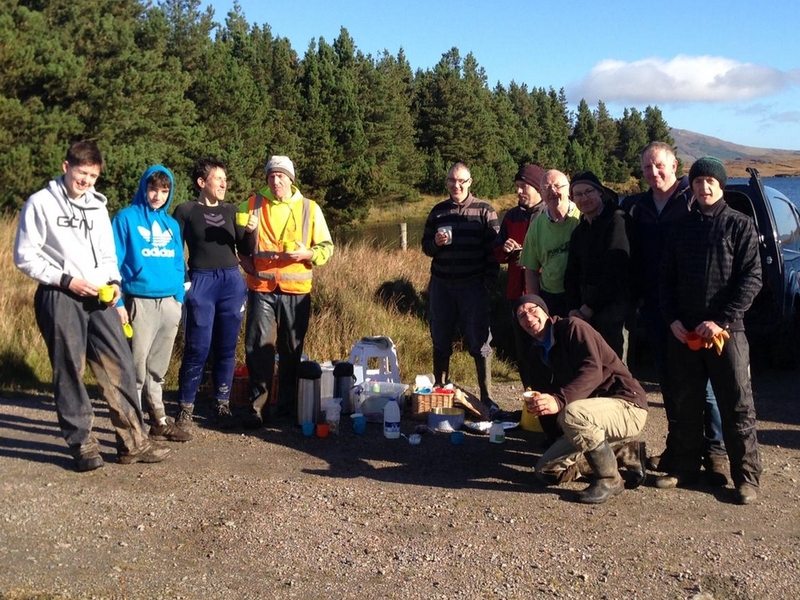 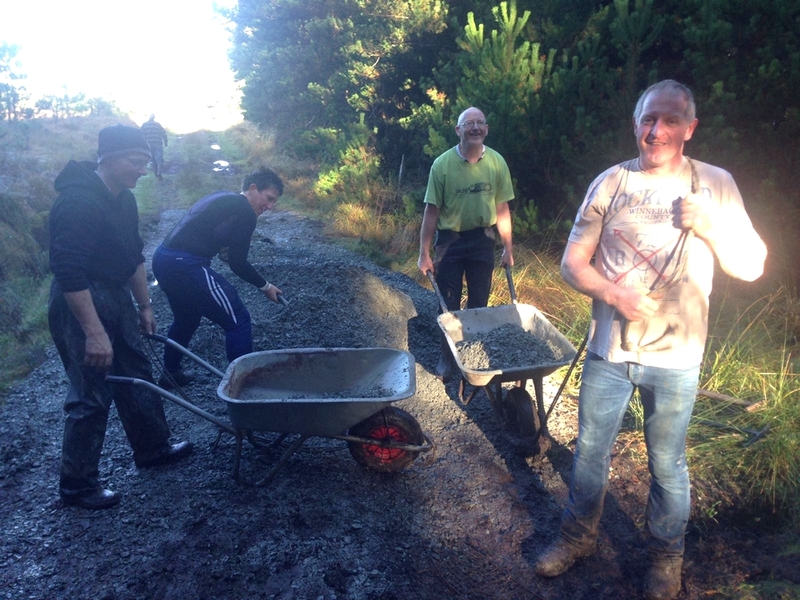 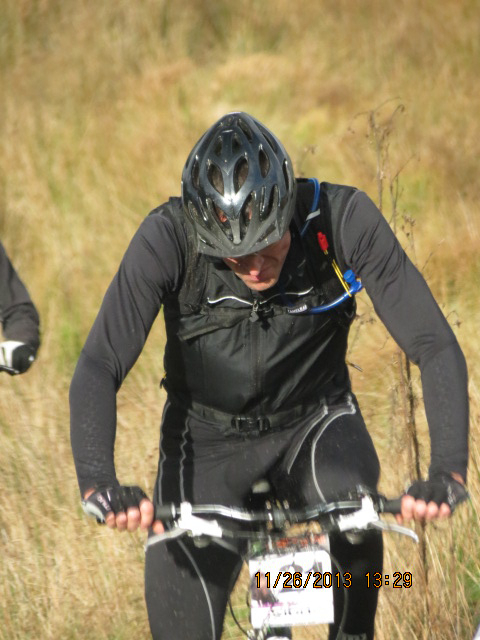 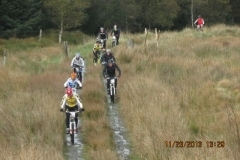 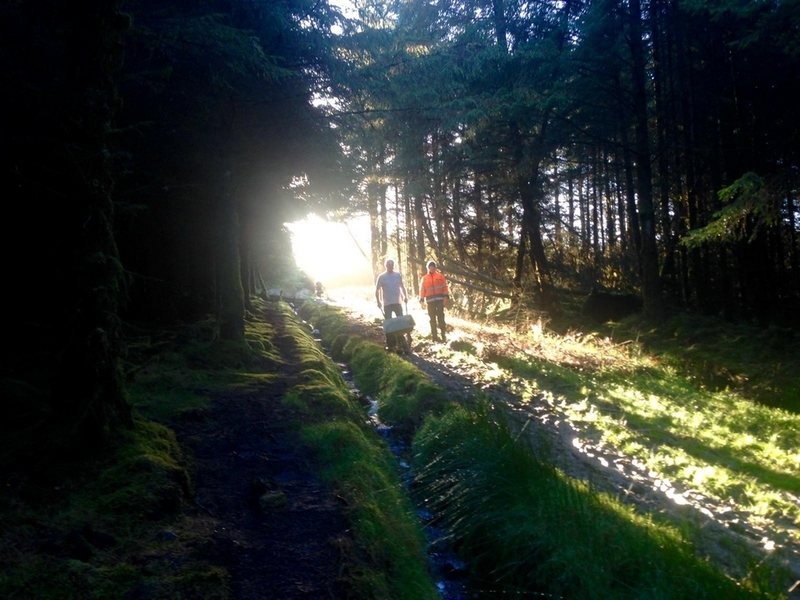 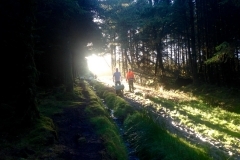 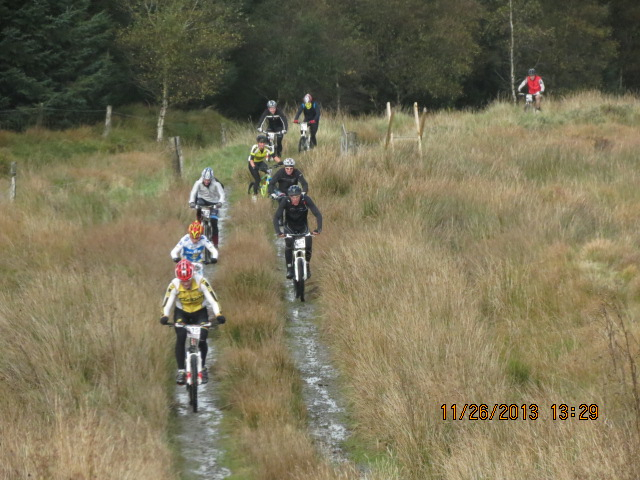 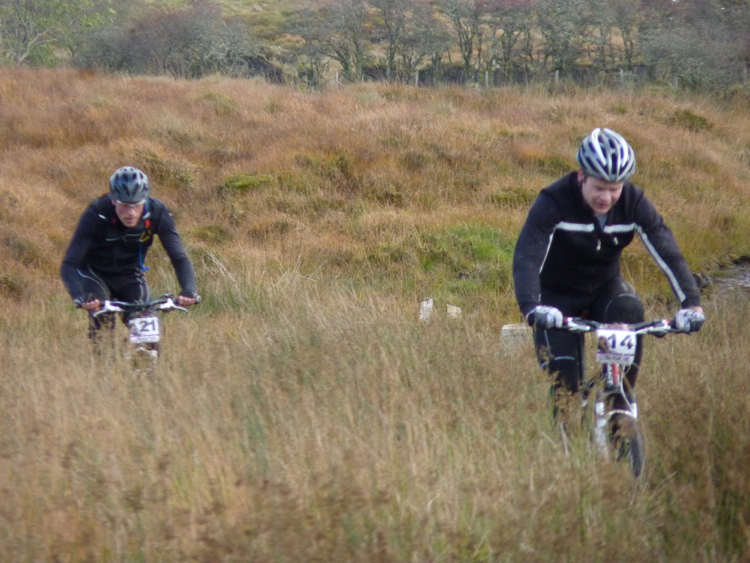 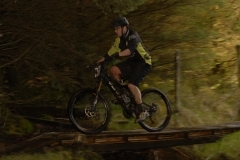 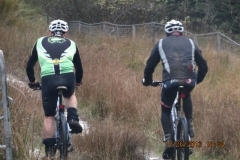 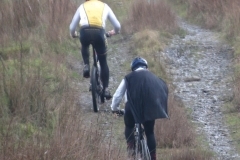 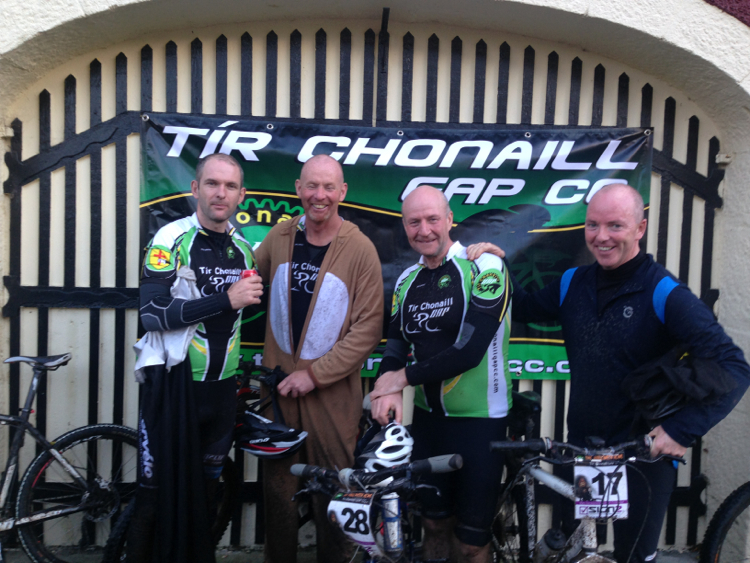 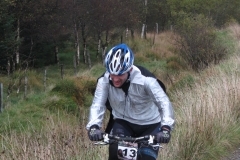 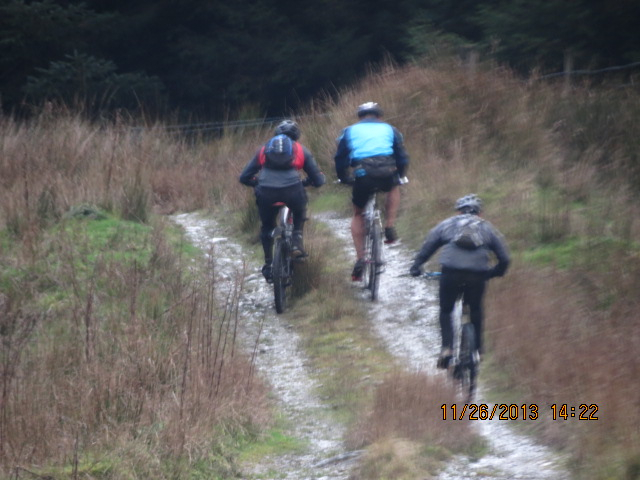 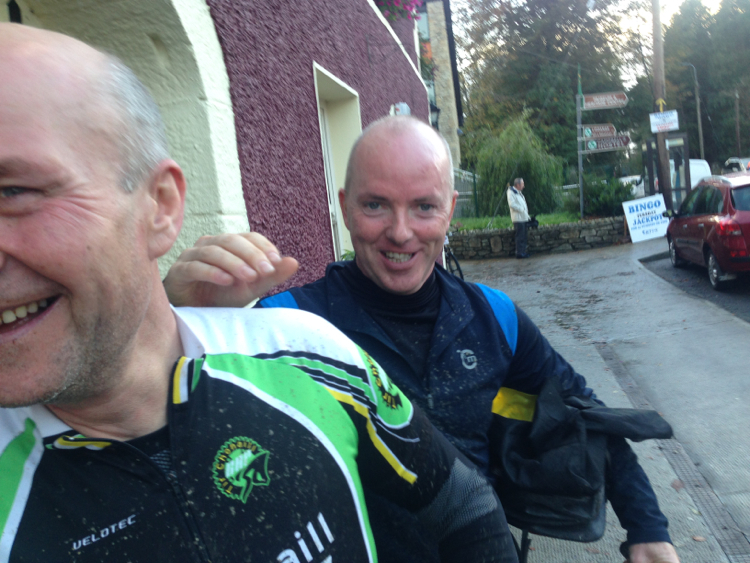 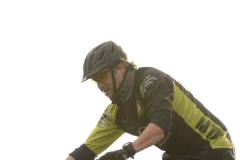 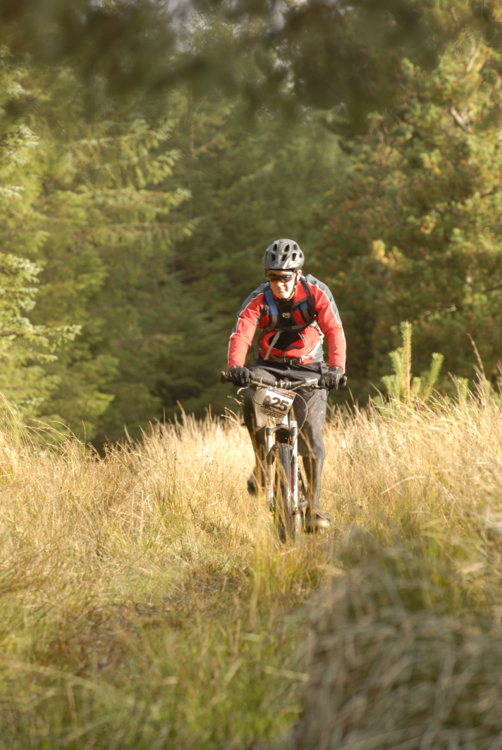 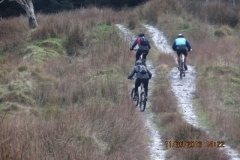 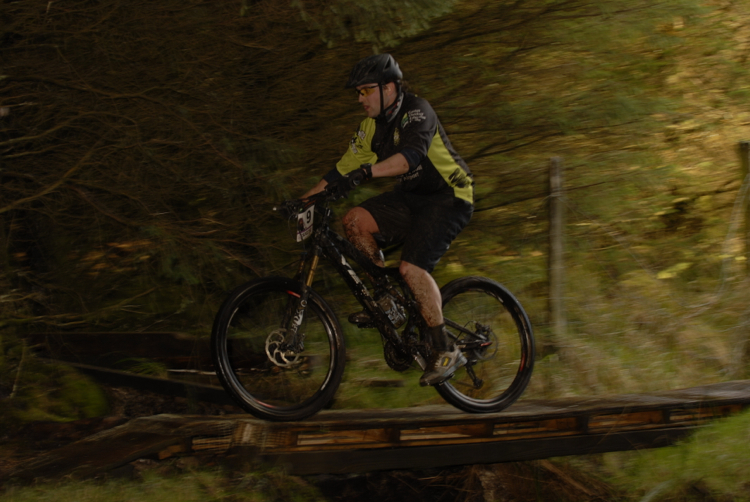 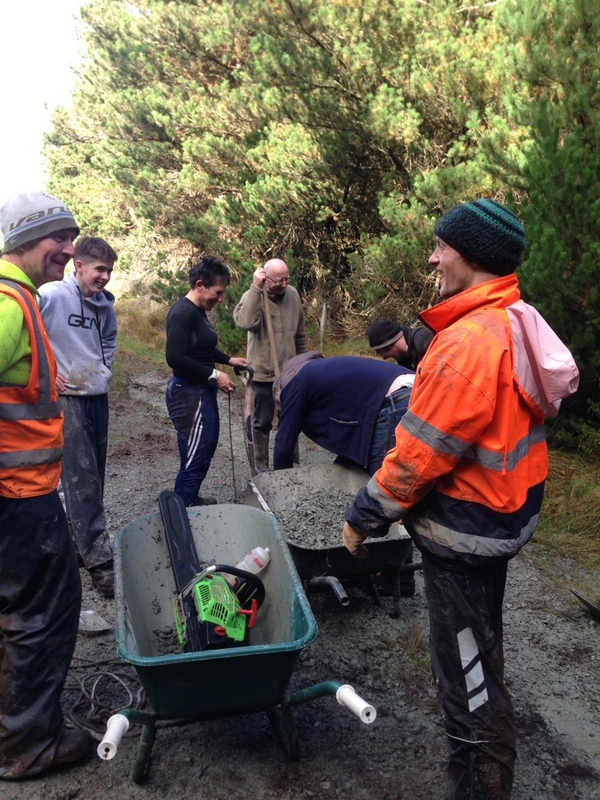 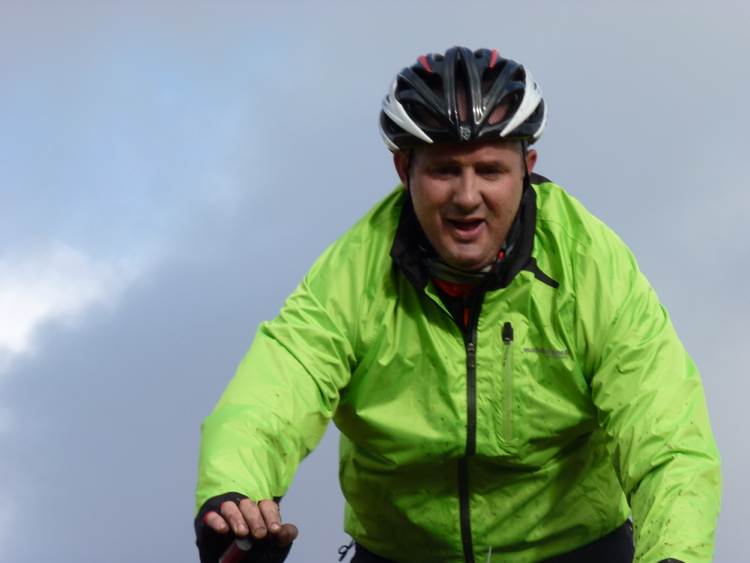 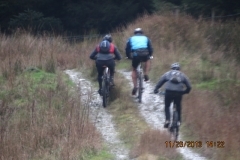 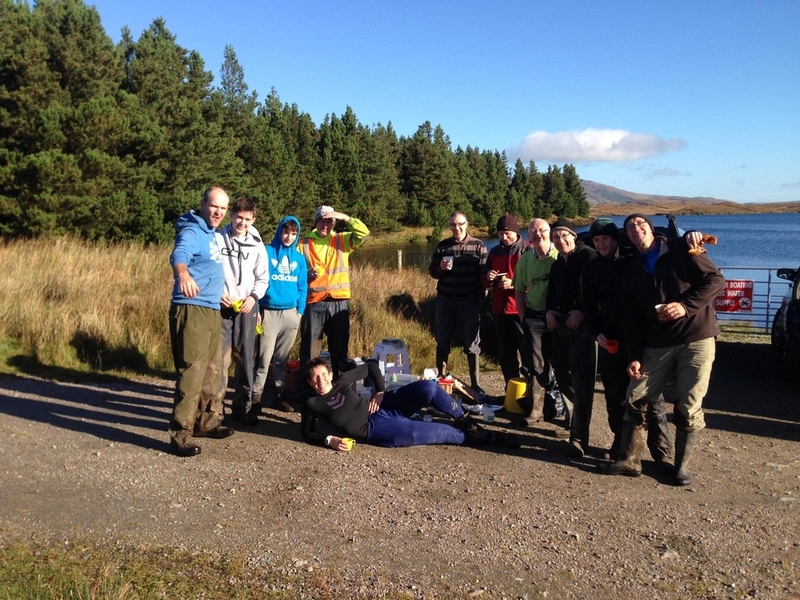 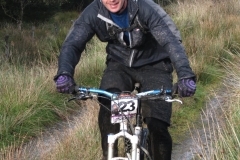 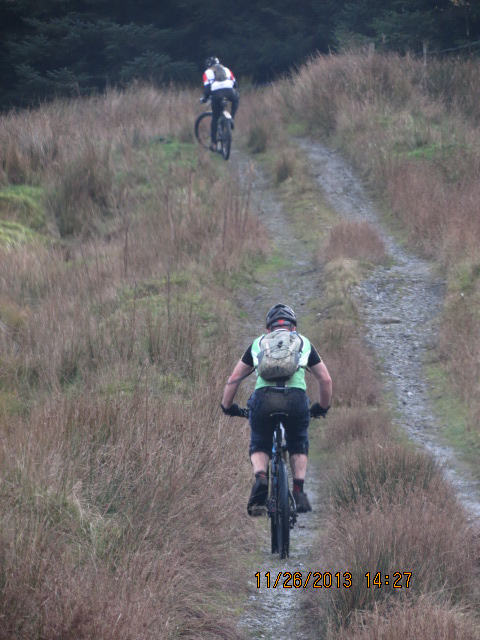 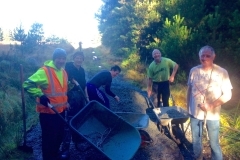 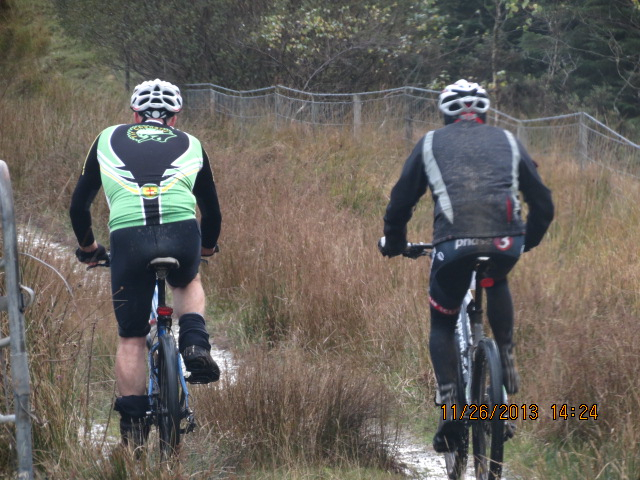 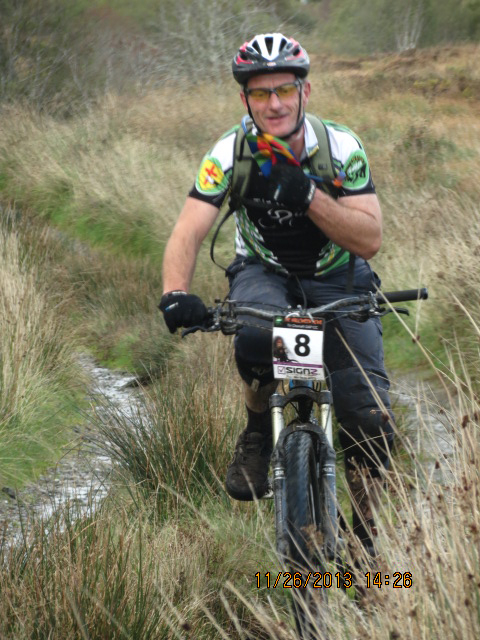 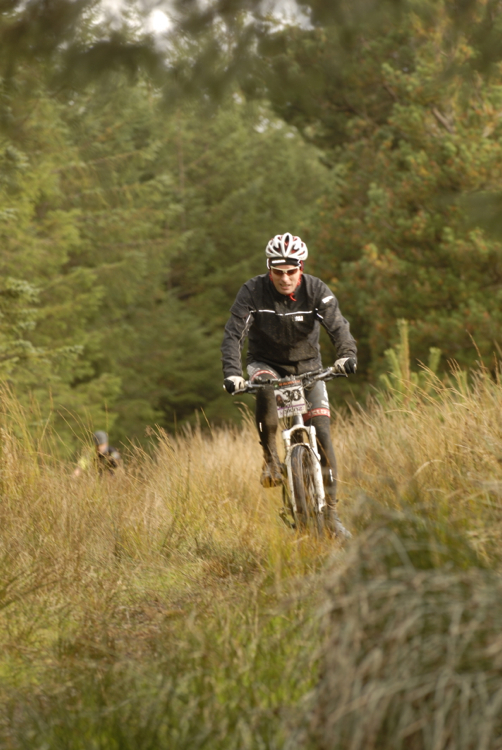 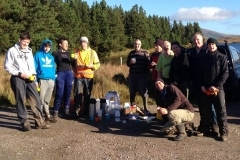 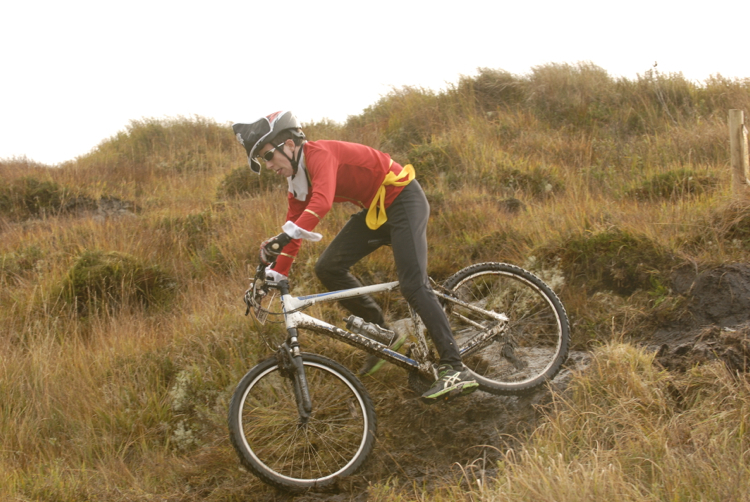 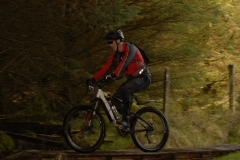 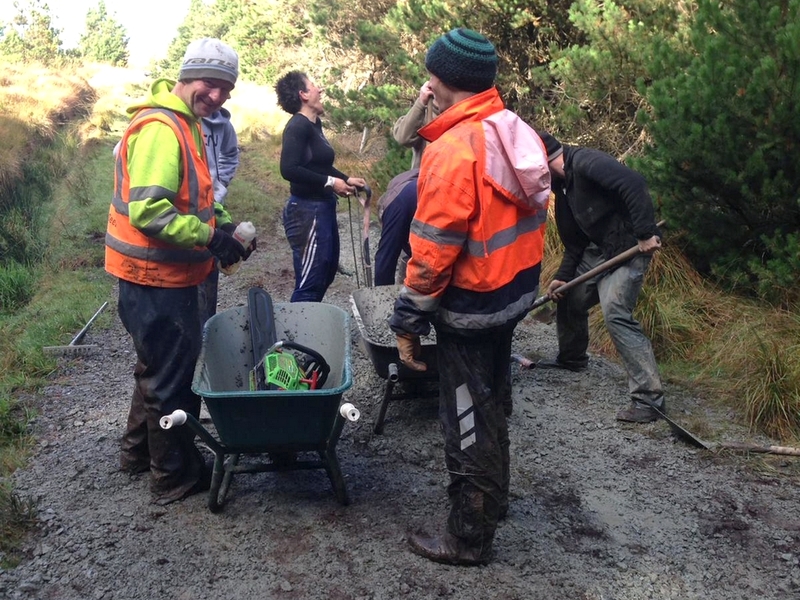 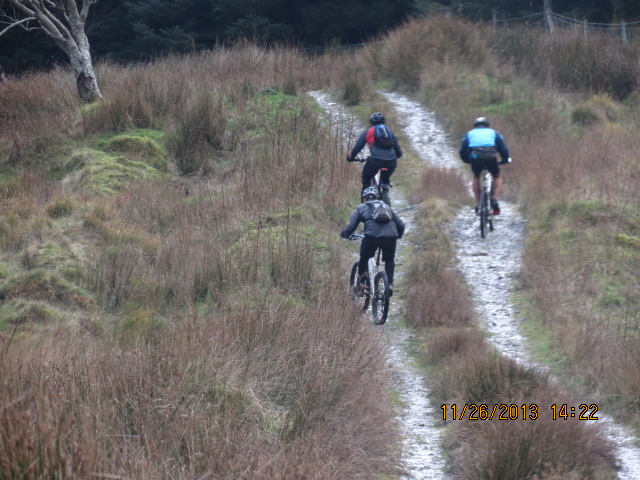 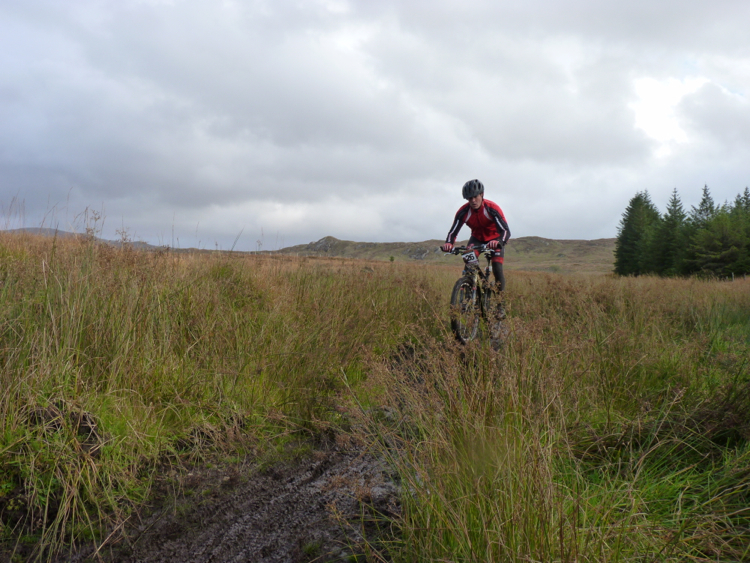 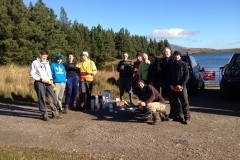 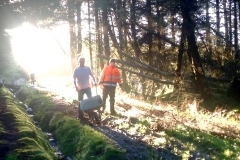 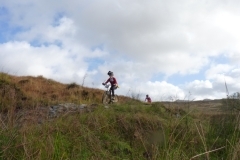 Two weeks before our Halloween Howl mountain biking event, the members of Tir Chonnail GAP made the most of the good weather and headed up to the trail in great numbers getting everything ready for you. 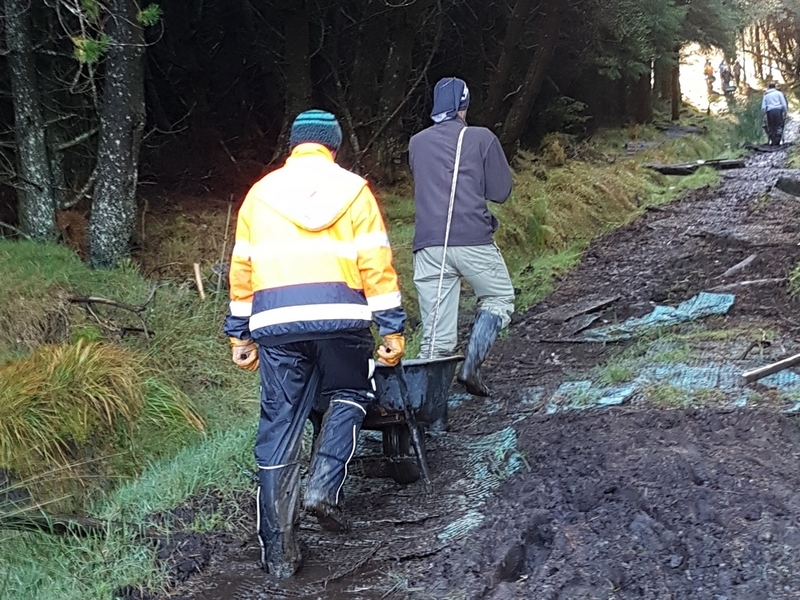 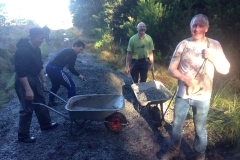 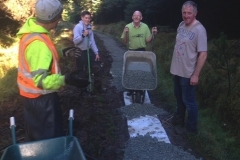 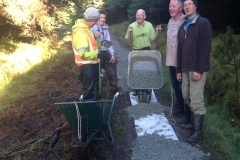 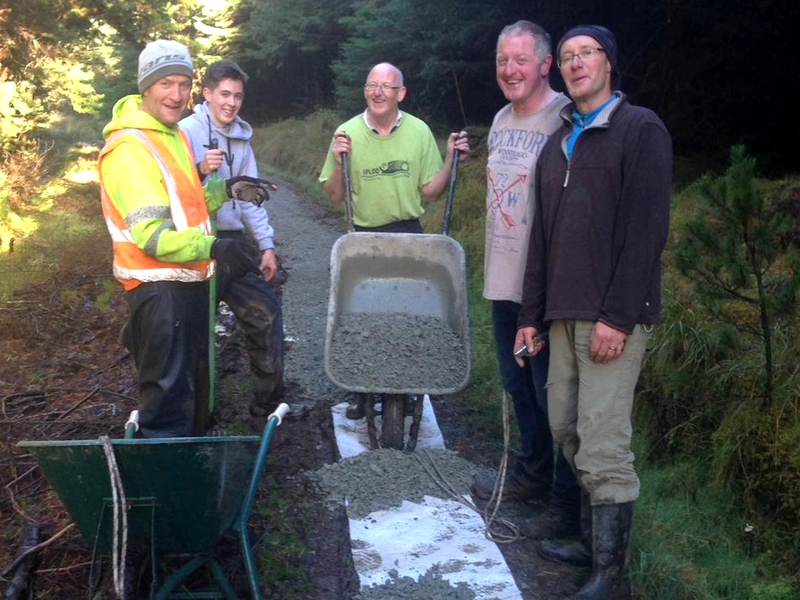 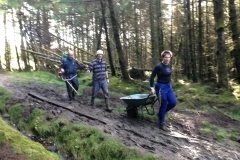 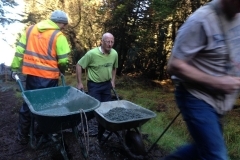 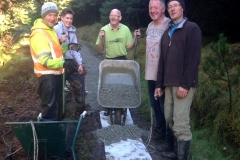 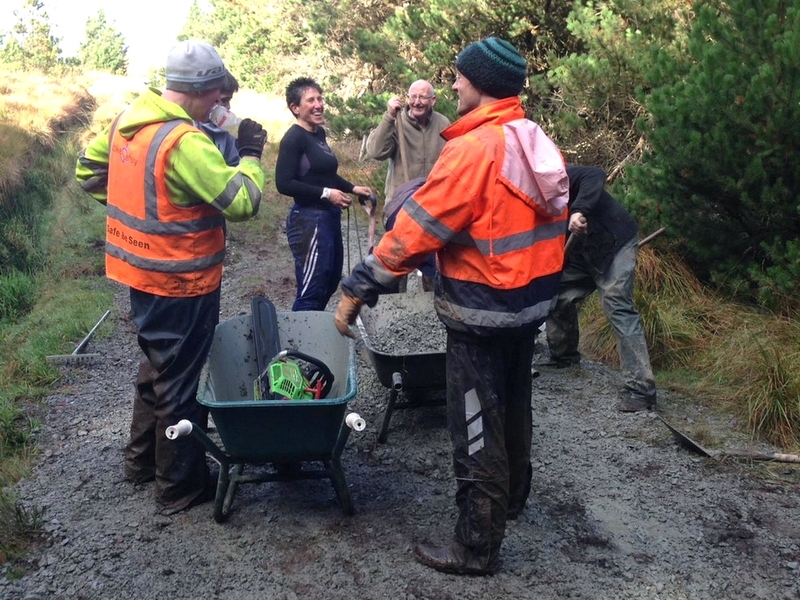 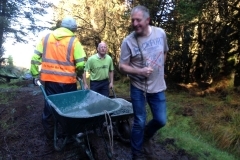 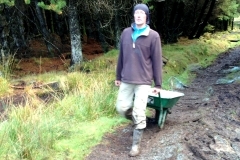 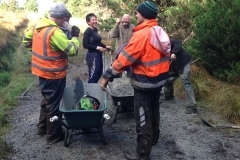 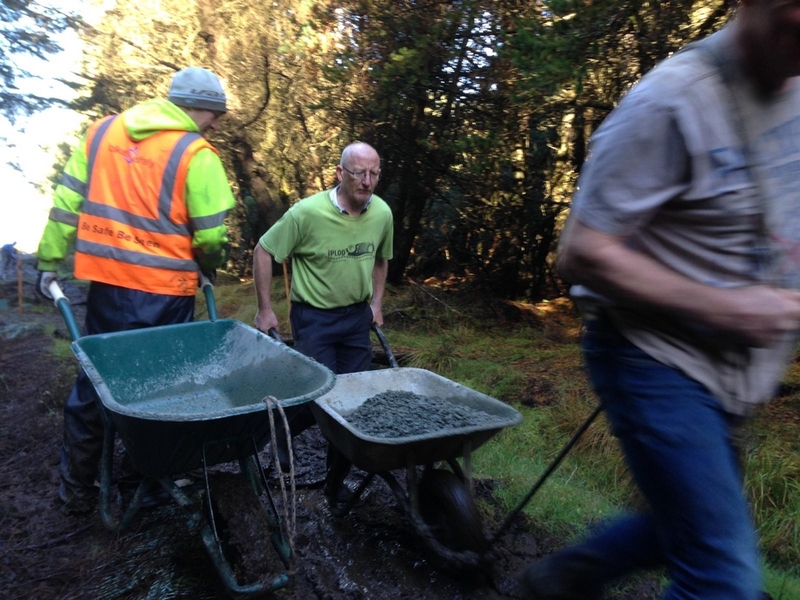 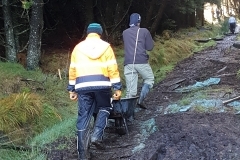 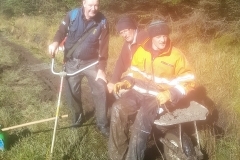 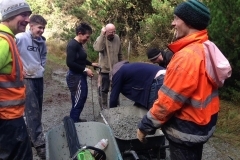 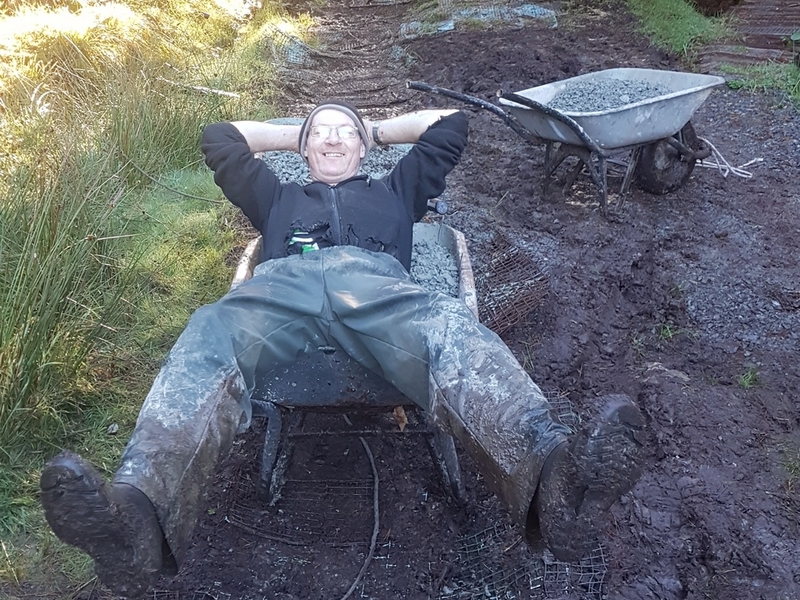 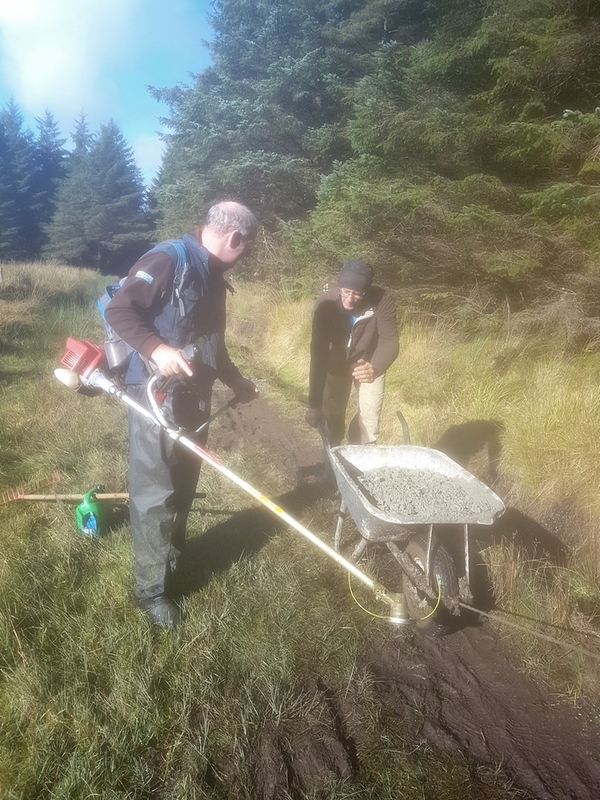 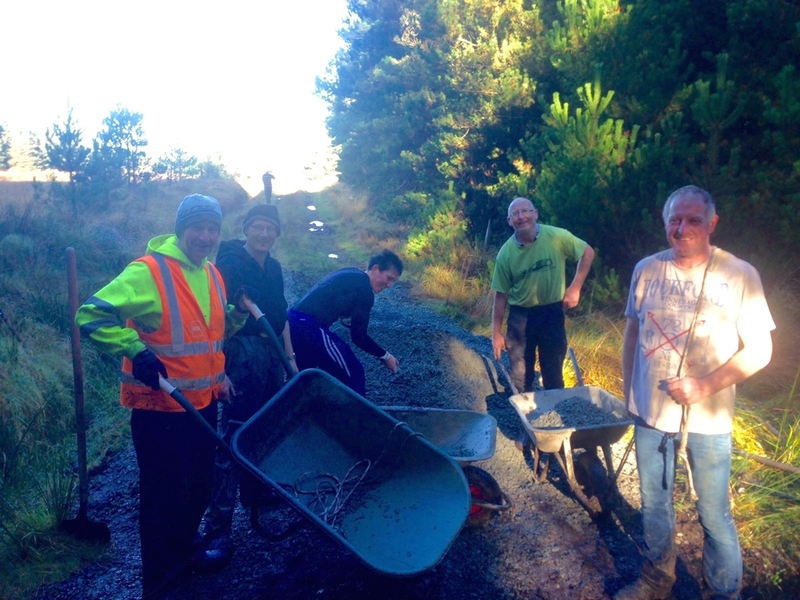 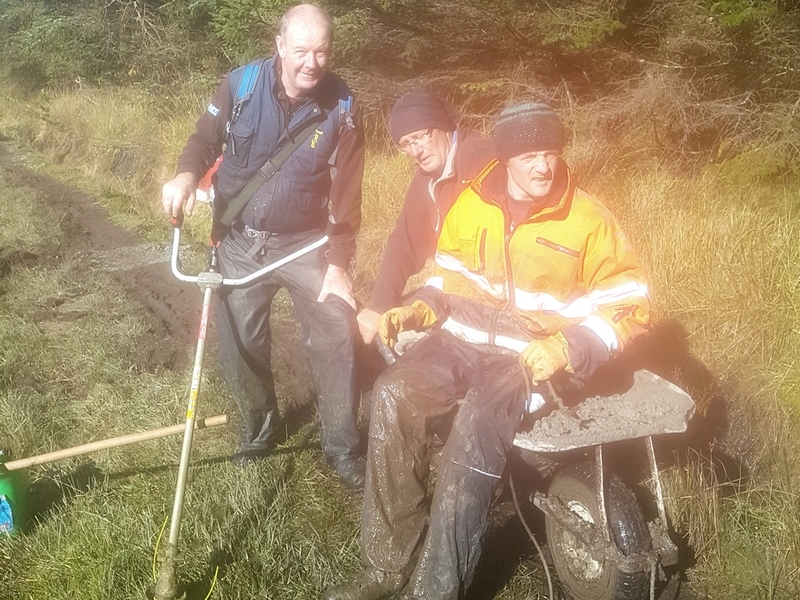 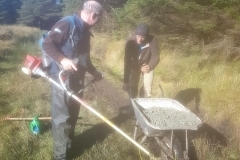 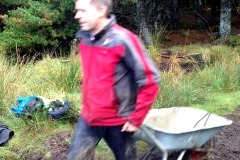 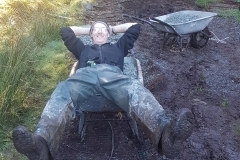 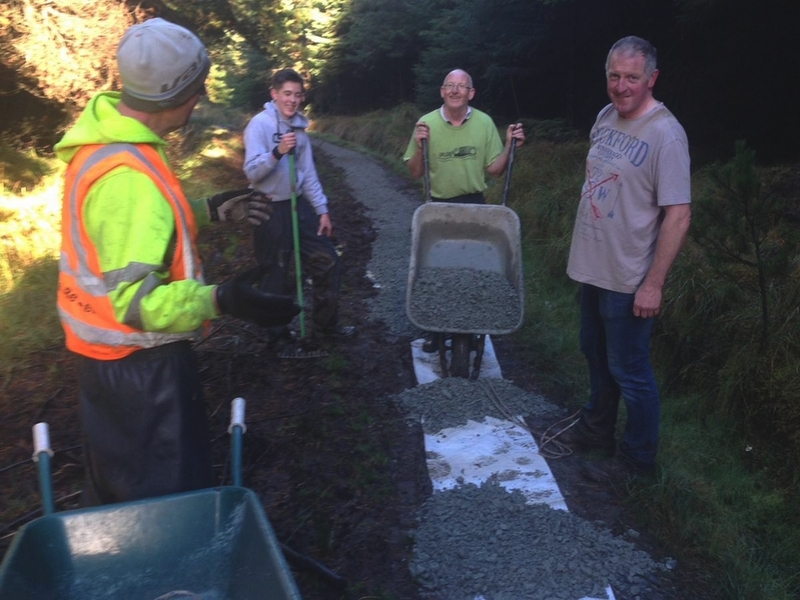 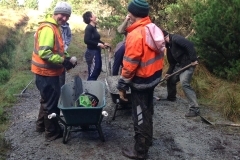 The wet Autumn hasn’t being kind to our trail, but it is amazing what you can achieve with a gang of willing volunteers, 40 tonnes of gravel, half a dozen wheel barrows, several lengths of quality rope and a lot of shovels. 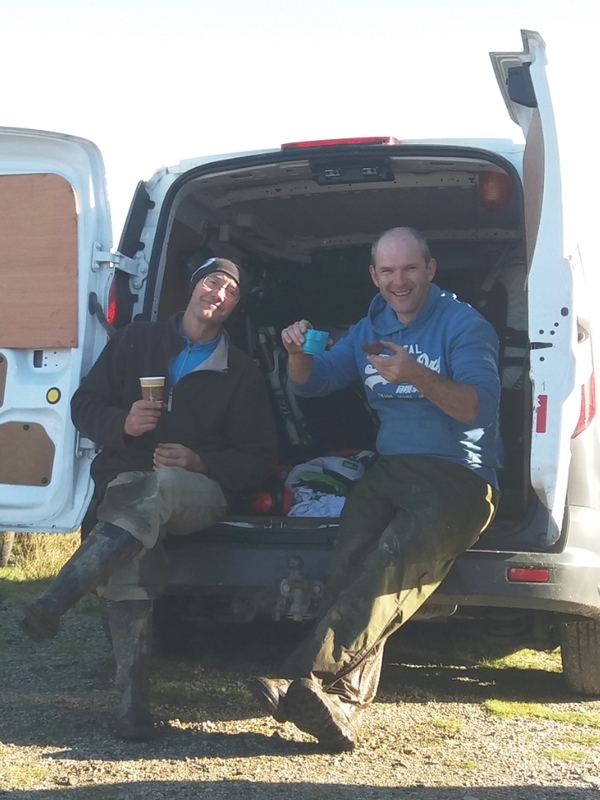 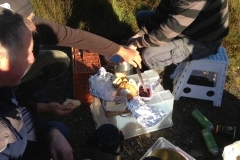 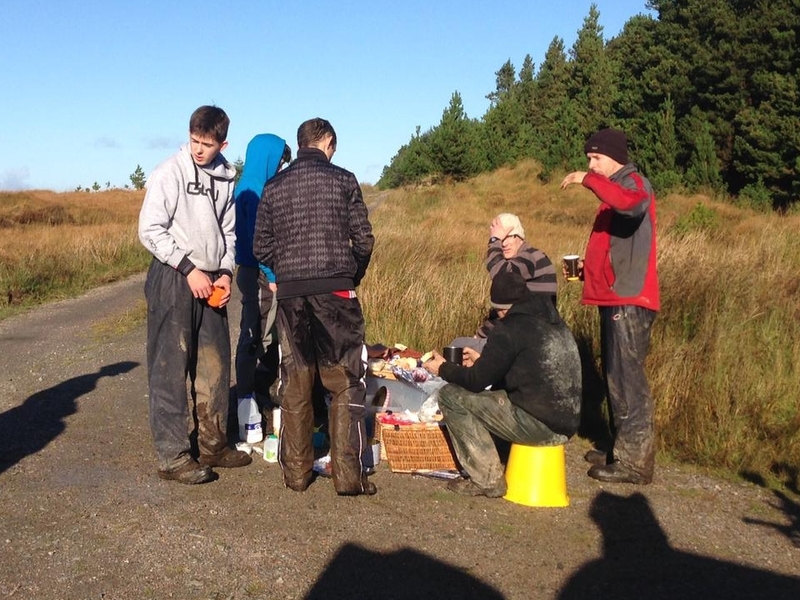 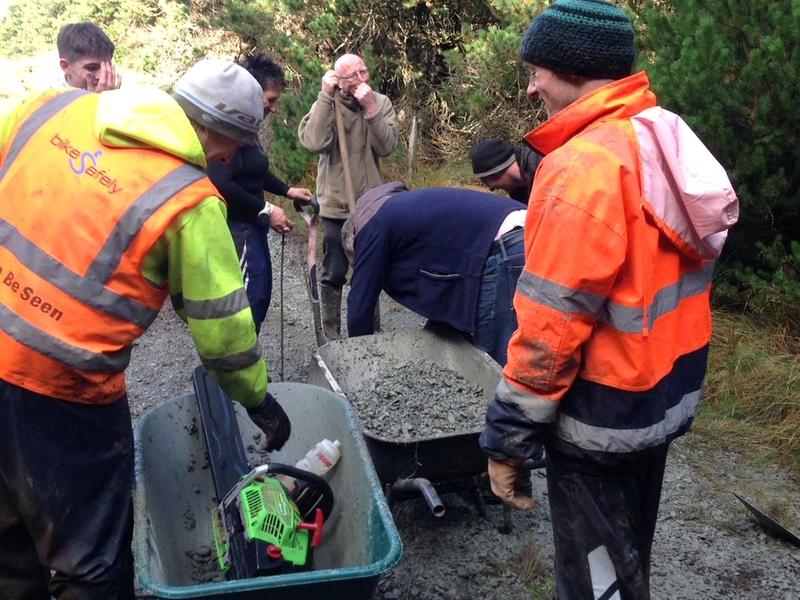 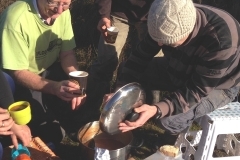 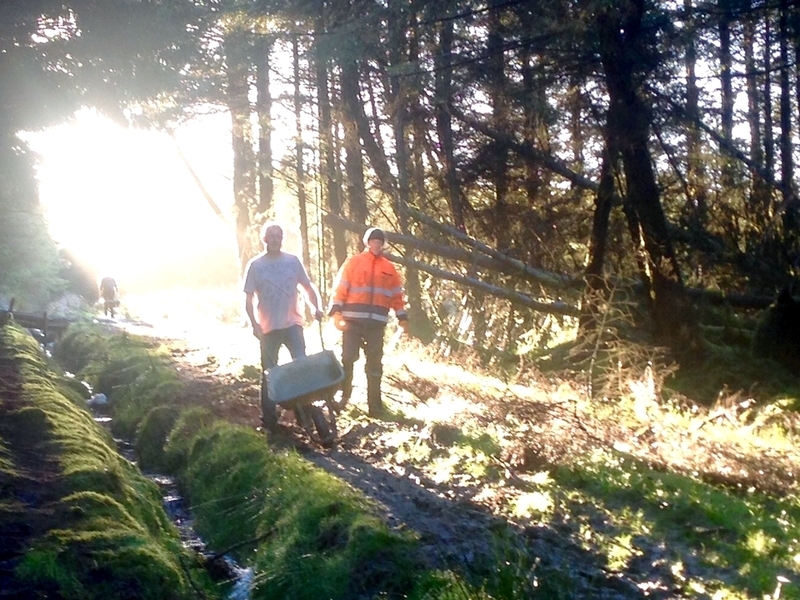 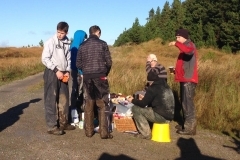 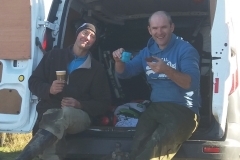 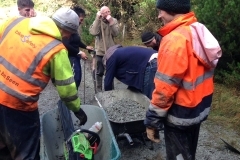 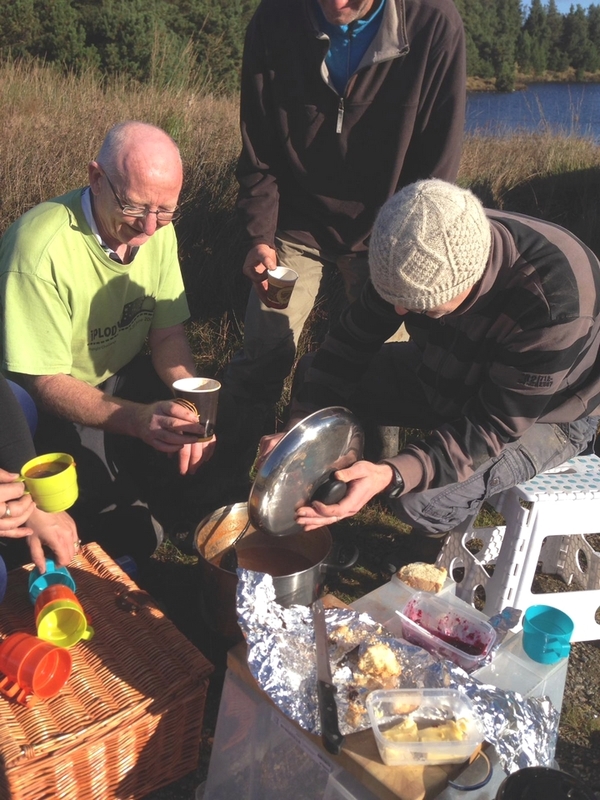 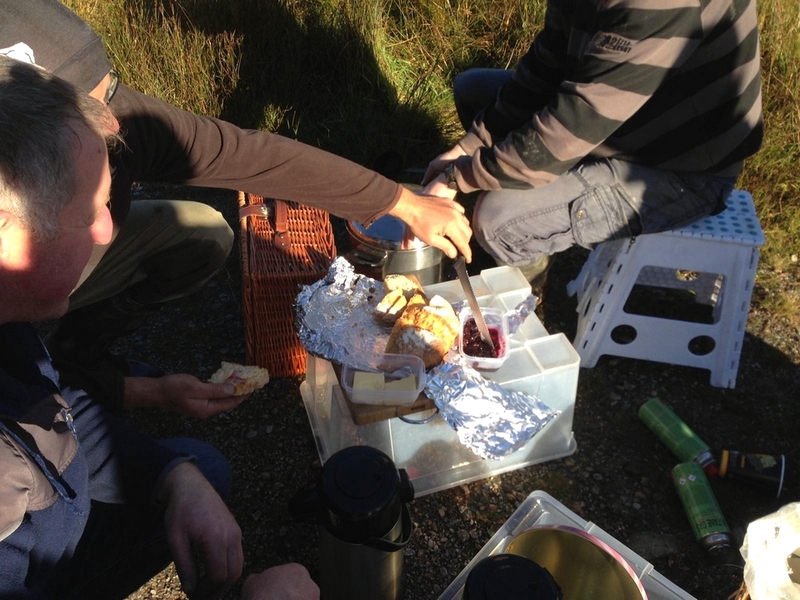 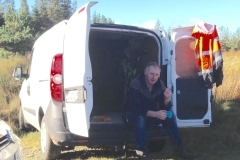 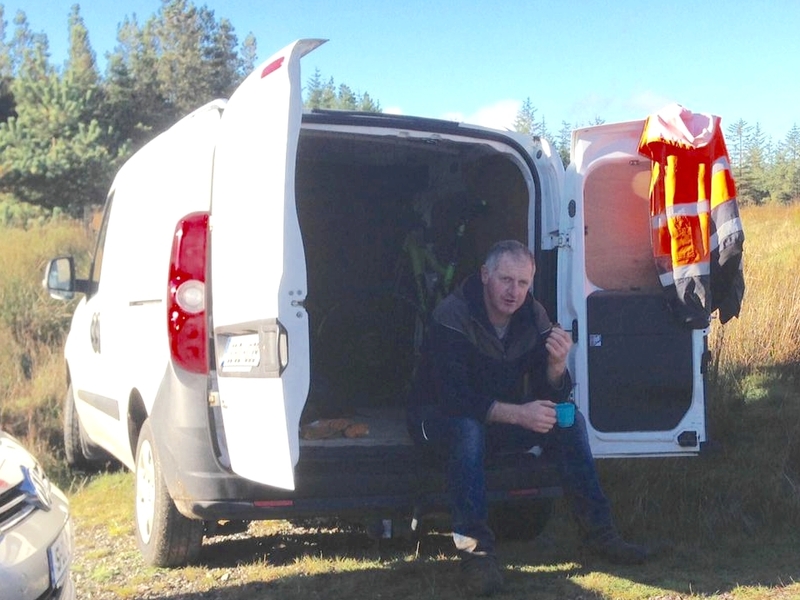 Drainage work done, the workers earned a fabulous and very welcome picnic. 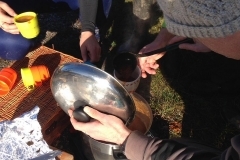 A special thank you to Amanda Curren, Nonie McGirr and Mary Furey for the feast! 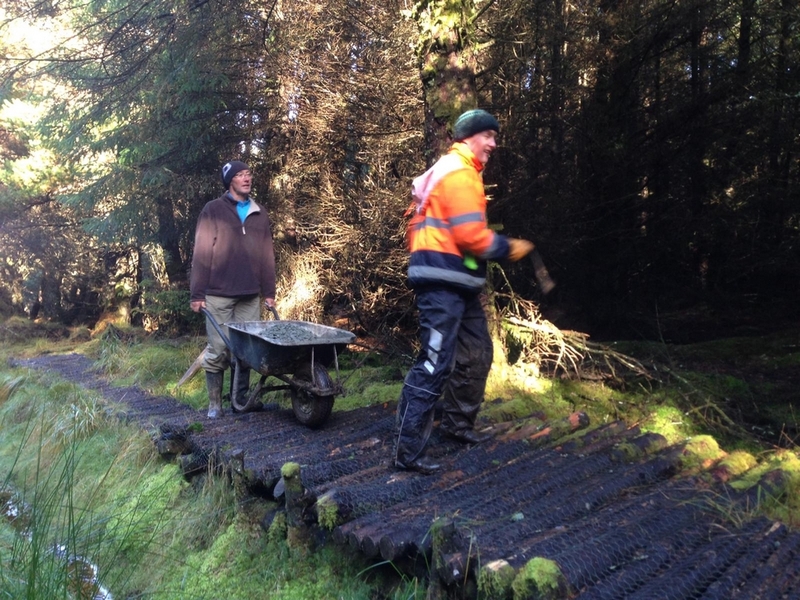 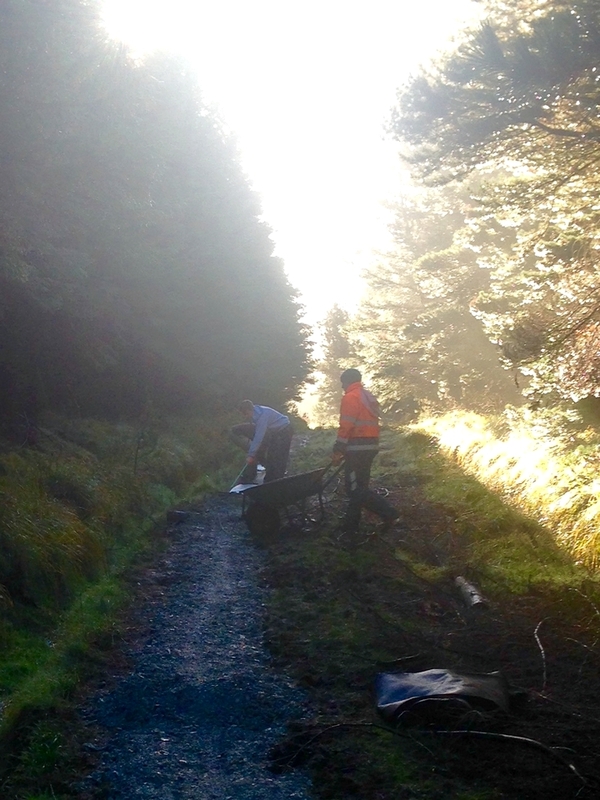 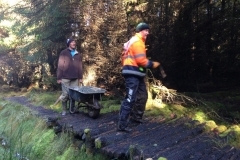 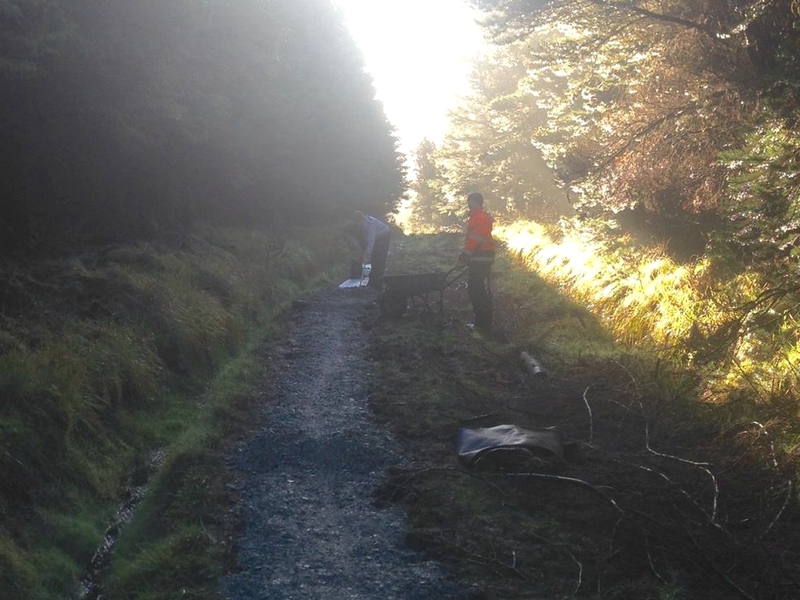 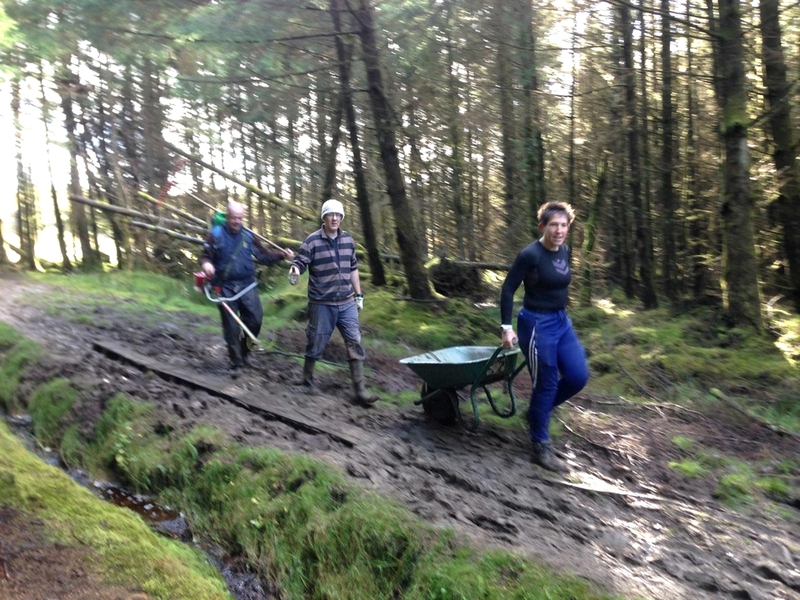 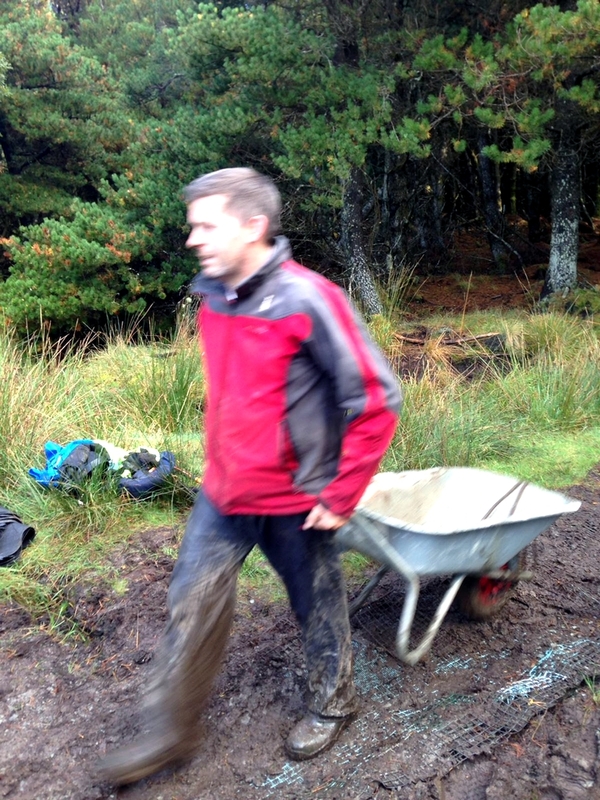 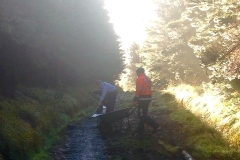 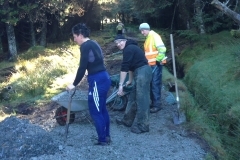 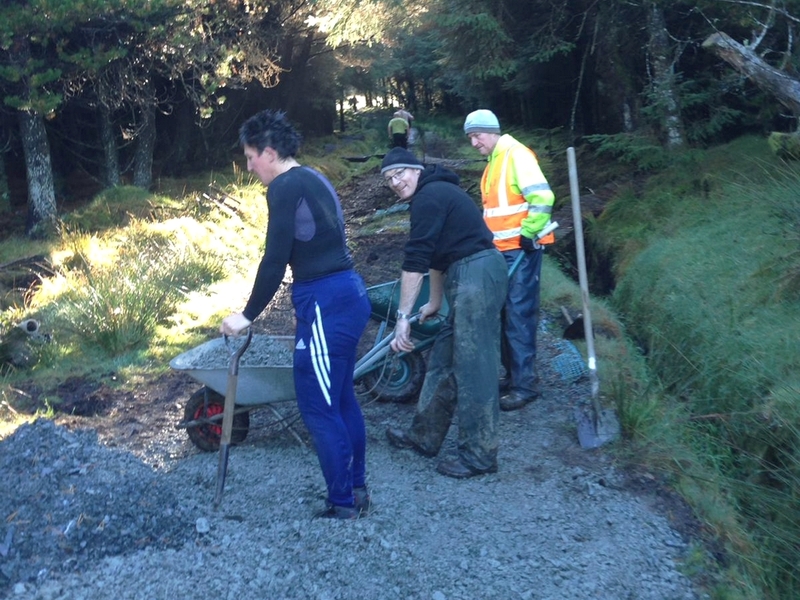 We are constantly improving the trail and every time we are up there we add to it. 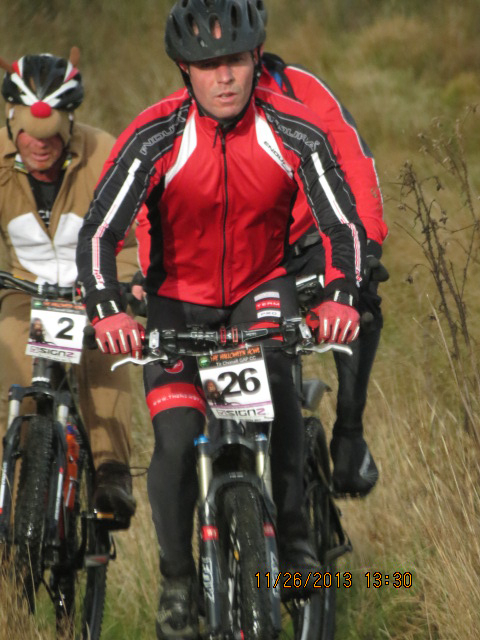 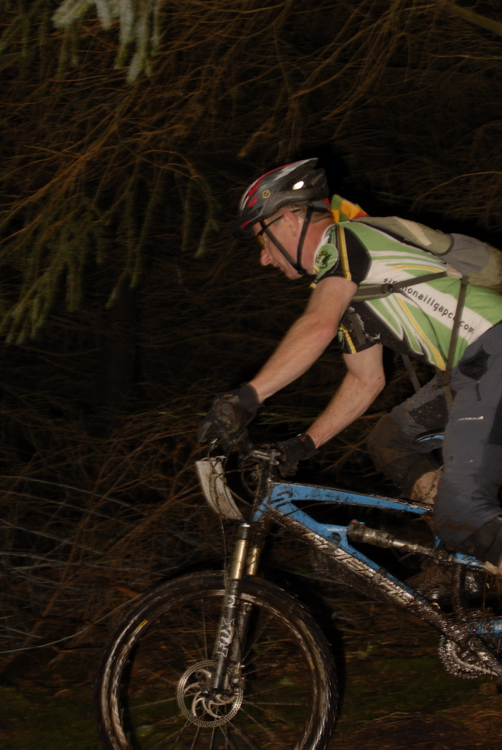 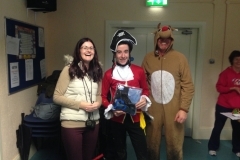 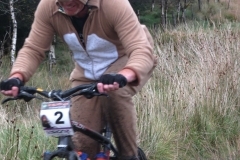 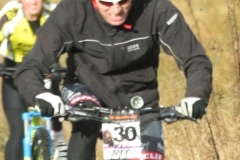 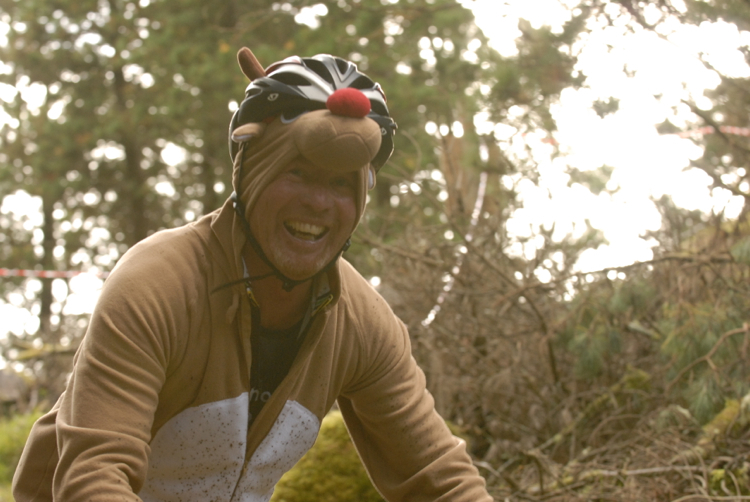 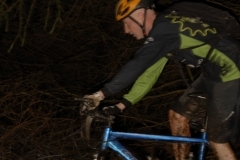 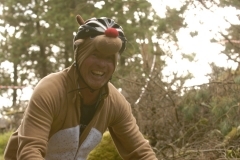 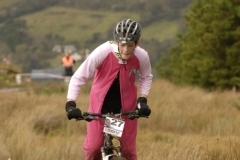 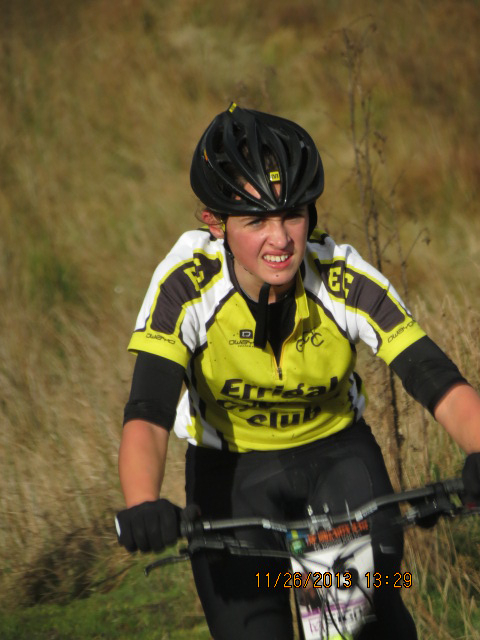 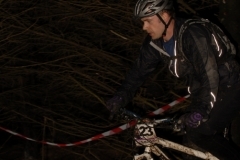 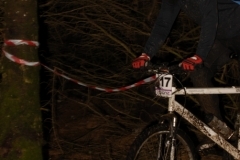 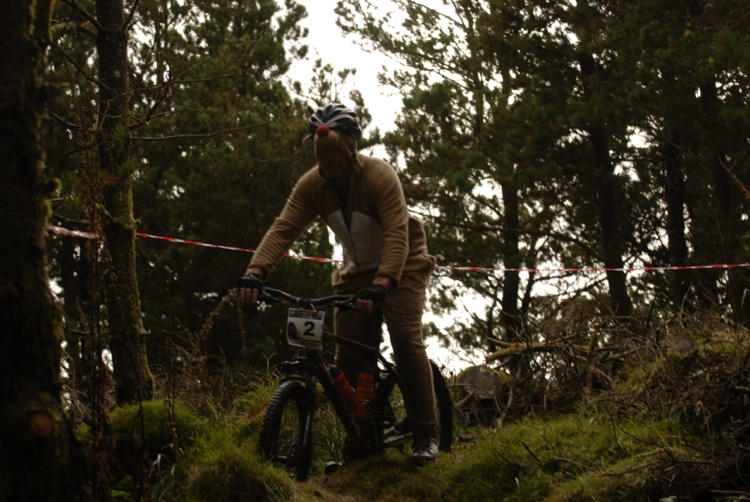 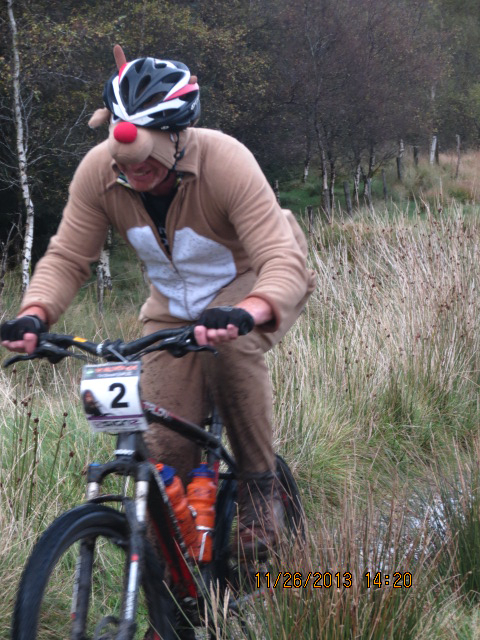 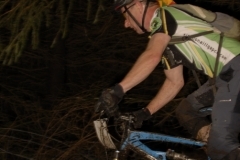 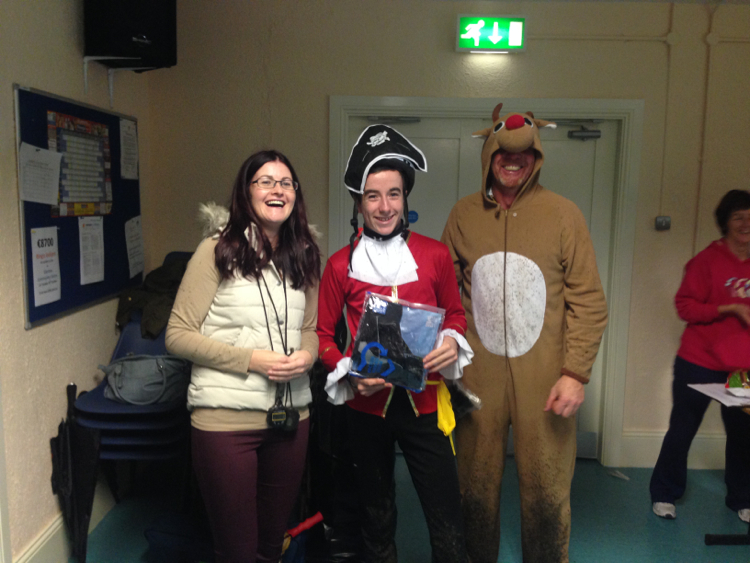 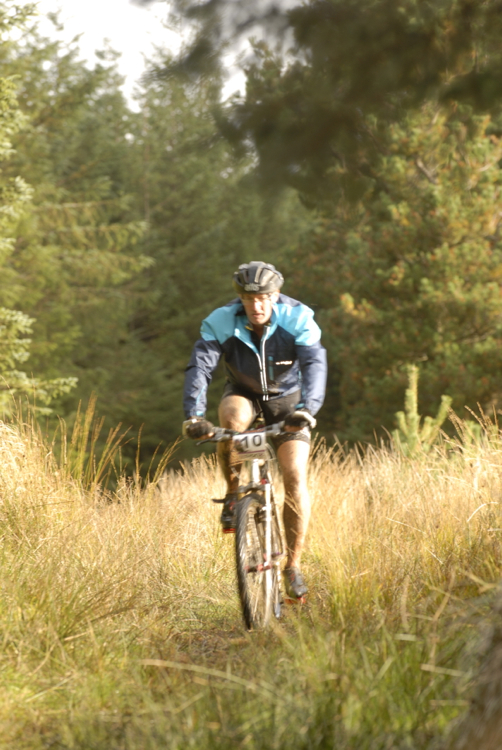 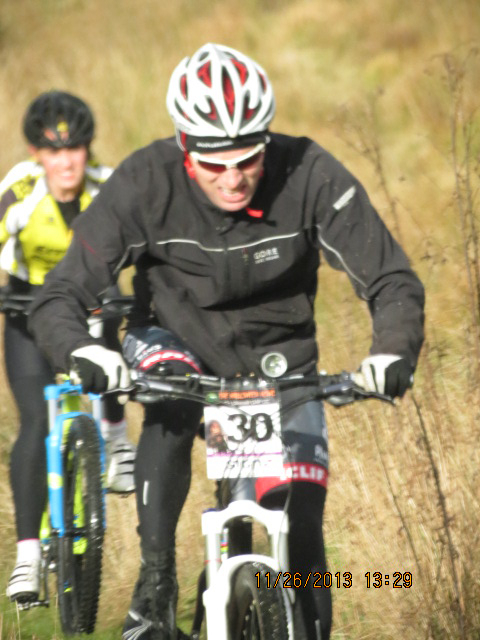 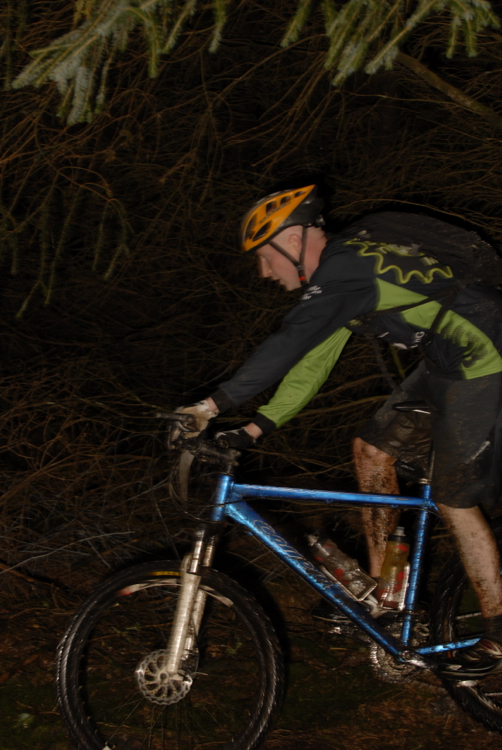 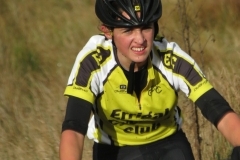 Seeing it’s Halloween there are some cracking surprises awaiting our event regulars…some are designed to improve the flow around the course, some are there for pure fun! 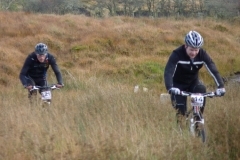 But don’t take our word for it, come along on 28th October and see for yourselves.